R-390 - Arguably, the R-390/URR and its later kin, the R-390A/URR, are the ultimate tube-type receivers. The first version of this incredible receiver was the R-390 featuring 33 tubes (includes the 3TF7 ballast tube,) double or triple conversion, two RF stages, six IF stages, modular construction, three audio filter settings, six selectivity bandwidths and frequency coverage from 500 kc. to 32.0 mc. in 32 - one megacycle wide - bands. It is a high performance receiver that really "shows its stuff" when conditions are poor but will also provide fairly nice audio quality when receiving conditions allow for it. The most common complaint is the cumbersome tuning that, while "parked" on one frequency is not apparent, shows up when spanning an entire band or changing ranges. Most of the "stiff tuning" complaints can be traced to an over accumulation of grease and dirt in the gear train. When clean and properly (lightly oiled) lubed, the tuning is very light and easy to manipulate. Only Collins or Motorola built the R-390 contracts which ran from 1951 through 1953. The military complained that the R-390 was very difficult to maintain and too expensive. Some of the maintenance issues involve the R-390's elaborate electronically regulated B+ circuit that uses two 6082 tubes along with two 5651 voltage reference tubes and a 6BH6 DC Voltage Amplifier tube. This circuit runs quite hot and accounts for many of the problems that develop in the audio module (where the regulator circuit is located.) Additionally, the R-390's gear train has a moveable "locking gear" that must be installed prior to removing the RF module (if you want to keep everything synchronized.) This gear was painted green and usually mounted with a screw on the front of the gear box. Each time the RF Module is removed and then replaced on an R-390, the KC and MC drive shaft split gears have to be reset for backlash, the Crystal Oscillator module's bandswitch has to be synchronized and the oldham coupler installed. Removal of any of the crystals in the Crystal Oscillator module requires removal of the hard-wired crystal oven. When the military complained about complex maintenance issues, they weren't exaggerating. 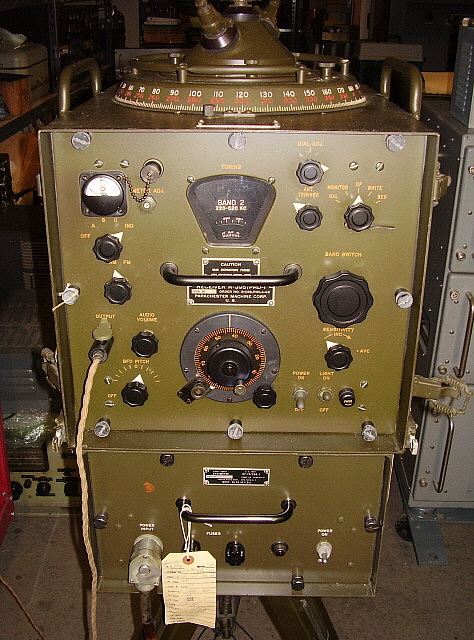 R-390A - Collins designed a replacement receiver that was introduced in 1954 with the designation of R-390A/URR. Though the new receiver looked very similar externally to the R-390, inside numerous changes were made to improve cost-to-performance and ease of maintenance. The new receiver's gear box was removable as a unit and synchronization would be maintained, the crystal oven just plugged into the Crystal Oscillator module (it is secured by screws though,) the B+ voltage regulator circuit became a standard 0A2 tube, the crystal calibrator was combined into the RF module (eliminating the separate Crystal Calibrator module of the R-390) and the Crystal Oscillator module was mounted to the RF module so removal of the entire RF deck kept everything synchronized together except the PTO. Most of the maintenance "quirks" of the R-390 were corrected in the R-390A. The major performance change involved the installation of four mechanical filters in the IF section of the receiver. The steep slopes of the mechanical filters gave the R-390A excellent selectivity on 16KC, 8KC (really about 11KC,) 4KC and 2KC bandwidths. The 1KC and .1KC bandwidths are crystal filter derived from the 2KC wide setting. The R-390A uses 26 tubes (including the 3TF7 ballast tube) with one RF stage, four IF stages, mechanical filters on four of the six selectivity positions, plus an 800Hz audio filter. When properly set-up, one can dig right through the QRM while maintaining fantastic sensitivity making the R-390A one of the finest tube-type receivers ever built. However, some ham AM operators find the audio on an R-390A to be a bit harsh due to "ringing" in the mechanical filters. The R-390A was produced in yearly contracts from 1954 up through 1967 (and very small contracts in 1968 and in 1984) with many different contractors building the receivers during those years. Though the R-390A's six modules and redesigned maintenance approach made field repairs easier, it was still a complex receiver. Though the military wanted a less expensive receiver, it certainly wasn't that either. The R-390 and R-390A receivers have provided reliable communications under adverse conditions for years and even though the designs are over 50 years old, they are still one of the best tube-type receivers around. 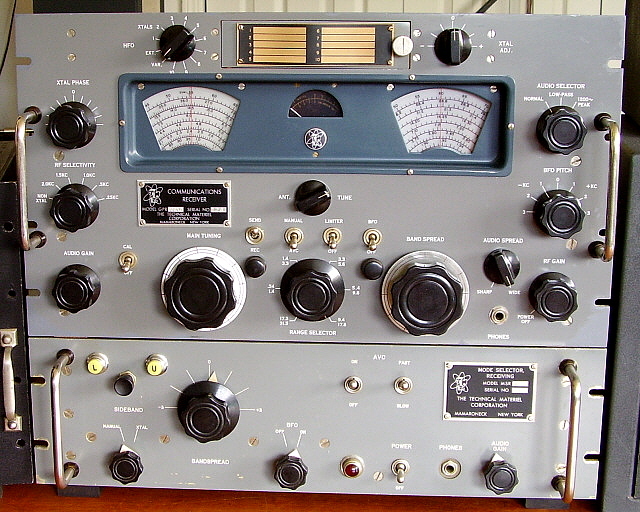 Many R-390 and R-390A receivers are still being used today, some in professional applications, but also for serious SWLing and, of course, in vintage ham stations around the world. Many AM operators prefer the R-390 version for its better over-all sound quality when listening to SWBC or AM stations in general, however one must consider the maintenance challenges when selecting the R-390 for a station receiver. Nowadays, many R-390 and R-390A receivers are being used in "as purchased" condition - that is, the receiver has not been rebuilt, restored or even thoroughly serviced and properly aligned (or is it "alined?") The performance of a fully functional, rebuilt (restored) and recently aligned R-390/390A is incredible. Contemplating rebuilding an R-390A? Go to our web-article "Rebuilding the R-390A Receivers" for easy to follow information and lots of photographs. Link below in the Navigation Index. photo right: Motorola 1956 contract R-390A. The early Collins and Motorola panels had silk-screened nomenclature rather than engraved nomenclature. By 1957, all front panels were engraved. There was a four year gap between the Imperial Electronics 1963 R-390A contract and the last year of "standard contract production" that was given to Electronic Assistance Corp. in 1967. There are two identification numbers used for the 1967 EAC receivers - a contract number or a order number. FR-36-039-N-6-00189 (E) is the 1967 EAC order number and DAAG-05-67-C-0016 is the 1967 EAC contract number. Both numbers will be on all of the individual modules and on the main frame. The data plate will be found with either the order number or the contract number shown but not both. It's unknown why different data plates were used on the '67 EAC receivers. Civilian sales receivers may have a data plate with an EAC "rocket" logo and no order or contract number. One of the reasons that the 1967 EAC is sought-after by R-390A enthusiasts is that these were the last versions built, using the newest components available. These receivers should require the least amount of rework. However, there are some quality concerns for some of the EAC production due to a supposedly high reject-rate from the military. These rejected R-390As were reportedly returned to EAC who then sold the rejects to the civilian public (ca. 1968) as new production. Urban legend? Several years ago, a 1961 Capehart contract R-390A with an olive drab painted front was found in the Northern Nevada area. It had been supposedly repainted by the USMC. Here is another 1961 Capehart with the OD painted front panel, also found here in Northern Nevada, in 2009. Also, North Korea has made the U.S.S. Pueblo into a museum. The ship had many R-390 and R-390A receivers onboard. There is a color photo on the Internet that shows some of the receivers from the U.S.S Pueblo and two of the R-390A receivers appear to have OD panels. All R-390A receivers left the contractor's facility with gray panels - it was the specification - but the "end-users" were liable to repaint during a rebuild so anything might be possible - just not original. This is probably the best known photograph of R-390A receivers sporting end-user front panel paint jobs. The installation shows banks of R-390A with dark panels, presumably black anodized finish. Note that many (not all) of the receivers have severe wear on the Kilocycle Change and Megacycle Change knobs indicating continuous operation of the sets. Note that the R-390A receivers in the foreground are also equipped with the vernier control on the BFO that was installed to allow fine tuning of FSK signals for RTTY use. 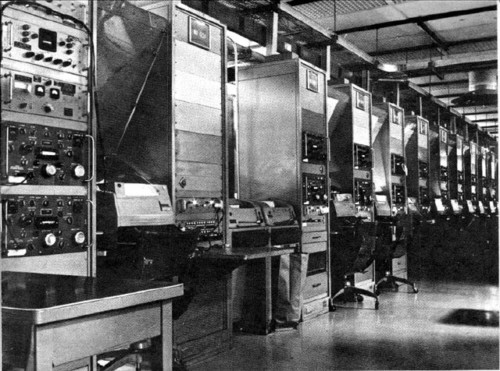 Most of the racks do have Teletype machines associated with them. This photo was of USAF Morse Hall at Clark Air Force Base in the Philippines. When some of the military R-390A receivers were decommissioned, they were sent to a facility located in Portsmouth, Virginia called St. Julian's Creek Annex. At this repository, thousands of derelict R-390 and R-390A receivers were piled one on top of another and stacked side by side on pallets. The receivers typically had their meters removed (due to the radium used on the needles and the scales) and usually the data plates were also removed. Many times the top and bottom covers were already missing. Sometimes receivers were found that still had their meters installed. The story goes that the meters were checked for radiation levels and removed if the reading exceeded a predetermined level. If the radiation level was below the spec then the meter was usually "tagged" with a stick-on paper dot. The final indication that the receiver was "ready to scrap" was to brand it with a "blue stripe" that was generally applied from a spray paint can. Many times, yellow paint was used but the use of blue paint has accounted for the moniker - "Blue Striper." These receivers were left out in the weather with no protection whatsoever. The receivers that were in the middle of the vertical stacks generally faired best while the receivers at the top of the pile got all of the rain, snow, sun and dirt. The duration of the storage depended on when certain pallets were sold off. At one time, the receivers sold for as little as $37.50 per receiver, taking into account the entire pallet had to be purchased. Apparently, over the years, R-390As came and went at St. Julian's Creek Annex. Some receivers may have been sold in small lots but the majority were sold by the pallet. It appears that well into the 21st century, R-390A receivers were still being sold from St. Julian's Creek. 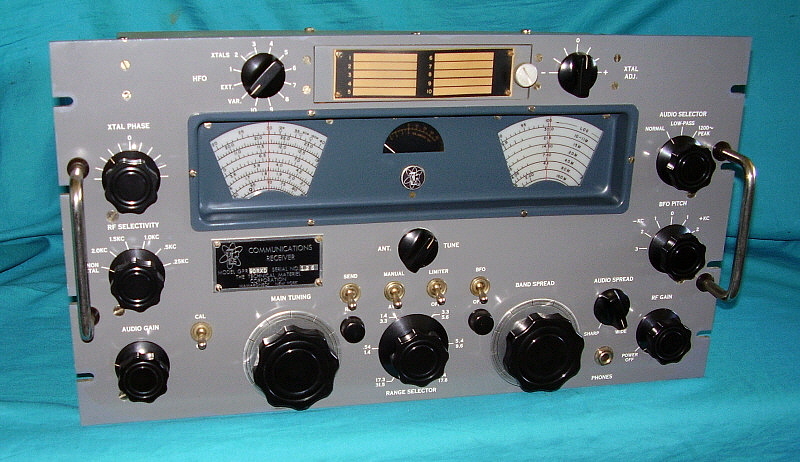 Some of the R-390A receivers sold by Fair Radio Sales in Lima, Ohio were "Blue Stripers" from St. Julian's Creek Annex. The Fair Radio Sales' "Blue Stripers" were the ones that were sold as "needing some work" - maybe a bit of an understatement. Selling price was an incredible $330 in the 1990s. It's generally thought that Fair Radio Sales would put together the "needing some work" R-390As from various condition "parts sets" and "used spares." Consequently, most (if not all) Fair Radio "Blue Stripers" are not true St. Julian's Creek R-390As and probably only have some parts that came from the annex. The R-390A shown above was sold by Fair Radio Sales many years ago and, after its purchase, it sat for many more years in a garage in the San Francisco Bay Area. It was donated to the museum in 2011 by NU6AM. Note that the panel was repainted a non-original very light grayish-white and the nomenclature has been filled in black. Additionally, this receiver has a Raytheon PTO dated 1977. I would think that this is probably a Raytheon rebuild of a Cosmos PTO. Overall, the condition of this "Blue Striper" is surprising good. Of course, none of the modules match (contractors) which seems to confirm that Fair Radio did "put together" this receiver from parts. What is odd is that they would go through the trouble to assure that relatively good condition modules were provided and then use a "Blue Striper" front panel. At the moment (2011,) the receiver is non-functional but updates on its condition will be forthcoming. Update 2013: Unfortunately, like a lot of receivers in the condition that this "Blue Striper" is in, this one has become a source of parts to restore other R-390A receivers that have faired better. The RF deck has gone into a 1962 Teledyne R-390A, the IF module has a bad 4kc mechanical filter but may donate the MF tuners to another IF module. The PTO is going into the 1961 Capehart. The ON/OFF microswitch went to repair an Amelco R-390A. It is unfortunate but parts are what keep other R-390A receivers in "top condition" so they can be operated and appreciated for the incredible performance they provide the user/owner. For more details on rebuilding R-390A receivers, with lots of photos of all modules, go to "Rebuilding the R-390A Receviers" - navigation link below in the Index. Basic Description - Electronics - Built along some of the same lines as the famous R-390 receiver, the Collins R-389 is essentially the LF companion receiver of the R-390 covering 15kc to 500kc in one tuning range and 500kc to 1500kc in the second tuning range. The R-389 uses very complex methods, both electronic and mechanical, to achieve its complete MW, LF and VLF coverage while still utilizing a 455kc IF. The receiver uses 36 tubes within five modules that interconnect and are mounted within the main frame. The 15kc to 500kc tuning range utilizes five permeability-tuned RF bands. The 500kc to 1500kc tuning range utilizes two permeability-tuned RF bands. The motorized band switching occurs seamlessly as the receiver is tuned from the lowest to the highest frequency within the two tuning ranges. Two RF amplifiers are used and the first conversion mixes the incoming RF signal frequency with the VFO (470kc to 1955kc output f) plus the 10.455mc Crystal Oscillator (8.5mc to 9.985mc resulting f) to achieve a 10mc IF. The second conversion mixes the 10mc IF with the same 10.455mc Crystal Oscillator to achieve the 455kc IF. This double conversion scheme was to allow complete coverage from 15kc to 1500kc with no gaps in the frequency coverage. Additionally, since the two mixer stages are 180 degrees out of phase, any drift within the conversion mixers is cancelled leaving only the VFO drift. This is similar to how the "drift-cancelling" Wadley Loop operates. From the second mixer circuit on, the R-389 utilizes the same modules that are found in the R-390. That would be the six-stage IF module, the two channel audio and electronic voltage regulator circuit module and the power supply module. Although the PTO (VFO) looks exactly like that found in the R-390, it's very different inside and tunes from 470kc to 1955kc. Mechanical Details - The manual tuning of the receiver RF front end uses clutch-coupled gears to rotate the main RF tuning shaft that has worm gears that perpendicularly engage and rotate the gear-driven front and rear line shafts that have worm gears that in turn engage gear-driven vertical screw-shafts. The RF shafts are cut with forward and reverse threads while the VFO and Mixer shafts are fine cut threads. All of the vertical shafts raise and lower the various slug racks as the receiver is tuned. This gear-driven system is very easy to tune and feels about the same as tuning a good condition, properly adjusted R-390A gearbox. Since the amount of spectrum covered in the two tuning ranges is so large and requires so many turns of the tuning knob, a clutch-coupled, motor-drive tuning system is provided. A separate motor-driven bandswitch is actuated a specific frequencies and allows seamless band changing as the receiver is being tuned. Two antenna connectors are available. Balanced input for 125 ohms input impedance from dipoles or other balanced antennae. Balanced is connected to the primary winding of each antenna coil. Unbalanced input is for random length wire antennae. This input is capacitively-coupled through a .01uf capacitor to the RF amplifier coils. The Unbalanced input impedance is not specified but is probably fairly high assuming that end-fed wires were probably the design target Z. The Balanced input utilizes a "Twin-ax" two-pin coaxial connector and the Unbalanced input utilizes a "C-type" coaxial connector. As mentioned, due to the low frequencies, no antenna trimmer is provided so the antenna impedance should be somewhat matched to the particular antenna input used. 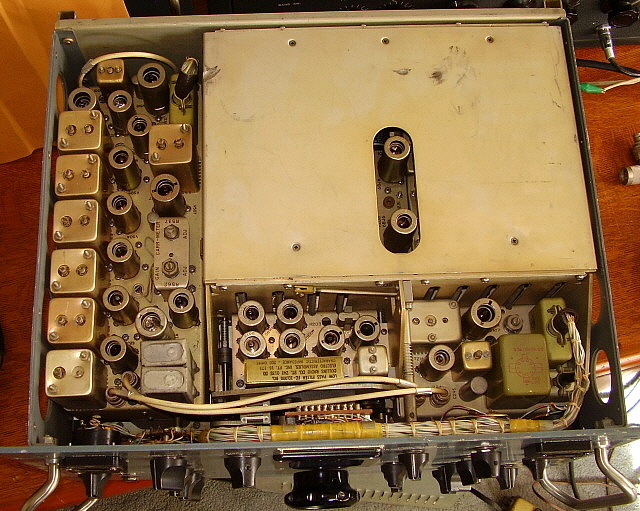 photo above: Top of the R-389 showing the RF module and IF module mounted in the receiver. The RF module has the slug racks located under the cover. The two tubes showing thru the opening are the two RF amplifiers. The Crystal Oscillator and first mixer is the to the left and the second mixer is to the right. The IF module is to the left side frame. For best results on longwave always use a 600Z ohm headset connected directly to the LOCAL audio output terminals on the rear panel. Connecting the headset to the PHONES jack will introduce a resistor network that reduces the audio level to 5mW to prevent over-driving the headset. However, since the audio level has to be increased to drive the phones adequately, high noise levels result. By driving just the headset only with the LOCAL output, the noise is greatly reduced allowing better copy of LW DX. 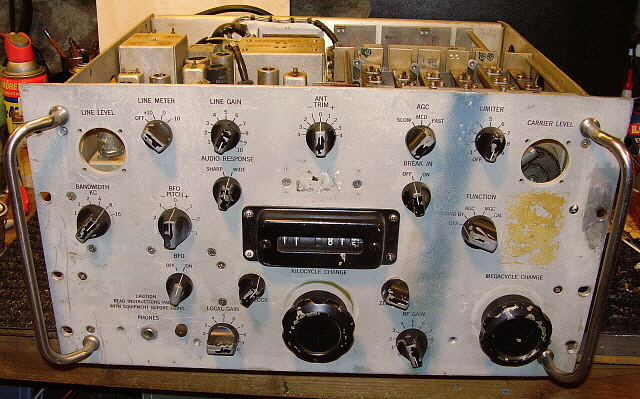 Go to "Vintage Long Wave Receivers" for more details on the rebuilding of this R-389 and a write-up on its performance. Navigation Index is at the bottom of page. 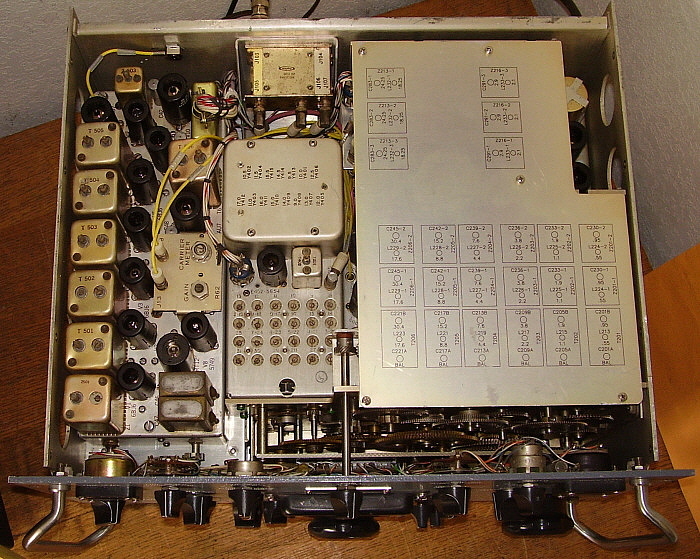 photo left: Bottom of the R-389 showing the Power Supply module on top, the VFO in the center and the Audio and Electronic Voltage Regulator module on the bottom. Motor drive system is directly behind the front panel. The long rectifier (green with fins) is part of the motor drive power supply. The bent, metal arm directly behind the tuning knob is the motor-drive clutch engagement arm that is cam-driven from the MOTOR TUNE control. The three coaxial cables behind the VFO are from the Antenna Relay box and connect the Balanced Antenna input and the Unbalanced Antenna input to the RF Module. The nickname "Airborne R-390A" was certainly appropriate for the R-648. After all, it was for use in Navy aircraft (doing RTTY in some airborne installations) and it uses a lot of the same mechanical design approach as it's bigger brother, the R-390A. Both receivers are modular and employ a mechanical digital frequency dial. However, much of the circuit design borrows heavily from Collins' 51J series of receivers, especially the dual variable IF with reduced number of crystals in the Crystal Oscillator and the fixed 500kc IF. Since the R-648 was going to be airborne, it had to be light-weight unlike the R-390A that weighs-in at around 80 pounds! By reducing the size of the components and mechanics along with eliminating most of the R-390A similarities, the R-648 only pushes the scale up to 30 pounds. Still, 17 tubes are used in the receiver providing two RF amplifiers, double conversion for most bands, three 500kc fixed-frequency IF amplifiers with two mechanical filters and an audio amplifier with three stages of amplification. When looking at the chassis, one sees the familiar slug racks and slugs, a PTO, modular construction with seven modules and, of course, a mechanical-digital frequency dial. One feature the R-648 has that neither the R-390A or 51J series has is tuning from 190kc up to 550kc. The remaining frequency coverage is 2.0mc up to 25.0mc. The GAIN control functions as the RF gain when the receiver is in the CW mode with the AF gain automatically set to maximum. The GAIN control functions as an AF Gain control when the receiver is the VOICE mode with the RF gain controlled by the AVC line. The Sensitivity control is provided to set the maximum available sensitivity and is a slotted-shaft pot behind the "toilet seat" cover marked SENS ADJ." The audio output level is set with a pot adjustment located at the rear of the chassis. This setting was to act as the "maximum" limit so that the headset used would not be over-driven. The output impedance is not critical and anything over 300Z ohms was considered appropriate. The audio output has ample volume if a 600Z ohm load is provided. This can be a loudspeaker with a 600Z ohm matching transformer. In actual use the R-648 is a very sensitive receiver that provides an accurate frequency readout and excellent stability. The selectivity is steep-sided as expected with mechanical filters but the early receivers had a 9.4kc MF for VOICE reception and many times that's a little too wide. The audio filter can be switched but it's easier and more effective in the AM mode to just tune up or down a couple of kc to reduce QRM. CW is fine with the 1.4kc filter and SSB also sounds just fine with the narrow bandwidth. The CW audio filter is very narrow. There is some vibration from the dynamotor and although it can be felt it doesn't seem to affect the receiver in any way. Noise from the dynamotor might seem a loud at first but, after the audio comes up, the dynamotor noise is pretty much masked by the receiver audio. A nice performing, small, light-weight receiver that's easy to find room for in any vintage ham shack. 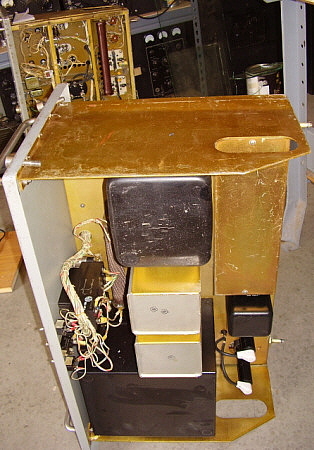 The sticker on the front panel is a "Narf Norva - Iran - 1st Qtr, 1975" label that indicates that the receiver went through the Naval Air Rework Facility at Norfolk, Virginia. IRAN doesn't indicate the country, Iran. It's an acronym for the process "Inspect, Repair As Needed." 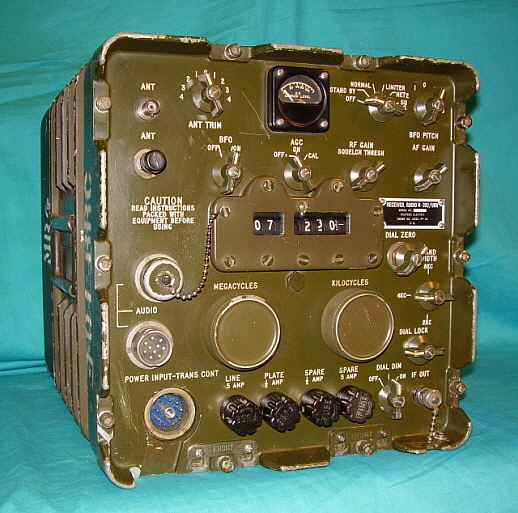 The R-725/URR is a 1967 Electronic Assistance Corporation-built R-390A receiver that was modified (in 1967) by Arvin Industries, Inc. for the USAF to use in semi-portable radio direction finding systems. Each R-725 receiver had the following modifications installed. First, the standard R-390A IF module was replaced with a new manufacture Series 500 IF module built by Arvin Industries or Servo Electronics. The Series 500 IF module was essentially a R-390 IF module (six IF amplifiers with no mechanical filters) that had minor updates to coax connectors to allow the Series 500 IF module to be installed with no modifications to the R-390A circuitry. However, further design development for the R-725 modification turned up a 60hz modulation problem that required additional modifications. A small chassis is mounted in the main frame space directly in front of the power supply module. This chassis has a 25vac transformer, two resistors and a connector-harness. This was a "hum-bucking" transformer that basically disconnected the VFO tube, the BFO tube and the ballast tube and powered the tube heaters with a "floating" 25vac (not referenced to chassis) and then used the resistive divider connected to B+ to "swamp" the AC with DC. The result was these tube heaters and ballast tube series string operated on +25vdc. To further protect the PTO from 60hz hum pickup, the entire PTO case had a grounded ferrous metal shield installed. The final modification was to the IF Output connector. The larger Series 500 IF module prevented connecting the IF Output cable to the back connector due to lack of clearance. A special "low profile" right-angle coax fitting was installed that allowed the IF Output to be available at the back panel. The contract number for the R-725/URR was DAAB05-67-C-2338 with a total number of receivers modified being less than 300. The Non-Secret R-725 Story - The purpose of the R-725 mods was for compatibility with military portable direction finders that used four vertical antennae per installation along with three receivers. The DF system used went back to the Bellini-Tosi type of DF set-up that used two crossed loop antennae with a rotating loop inside to create a radio-goniometer. Bellini and Tosi had discovered that crossed loop antennae would "re-radiate" the signal they were receiving within the small field inside the antenna's space. The "re-radiated" signal retained all of the directional properties of the original signal and could be measured for varying signal intensity dependent on direction. The crossed loop antenna size didn't affect the frequency of operation allowing for reduction in the size of DF loops on LW. The original Bellini-Tosi system dated from around 1900 and the system was sold to the Marconi Company around 1907. By the early twenties, vacuum tube amplifiers were being added to increase performance capabilities of the DF antennae systems. The most common B-T DF systems used the crossed loops but some larger systems used the four-square vertical antenna system. This system was developed by Adcock during WWI and because the connections to and from the four square verticals were underground it didn't respond to skywave propagation and allowed ground wave DFing over long distances. The B-T DF and Adcock systems continued to evolve and improve with the systems being used throughout WWII. During WWII, oscilloscope displays began to be used for direction indications. After WWII, larger DF systems continued to be developed up to the mammoth "elephant cage" antennae ("Wullenweber" was the actual name) that were over a thousand feet in diameter and consisted of several "rings" of circular antennae all working to provide accurate DFing over great distances and wide frequency spans. By the 1990s, most of these large arrays were becoming obsolete and nowadays most have been dismantled. The mechanical filters used in the R-390A resulted in signal path phase shifts that caused errors to show up in the DFing electronics. When used with the four square antennas, the low frequency modulation added via the radio-goniometer interacted with the mechanical filters creating the error. Early versions of this DF set-up had used R-390 receivers and the radio-goniometer was located quite a distance from the receivers to reduce any interference. photo right: Top chassis of the R-725 showing the Series 500 IF module on the left side of the main frame. photo above: The underside chassis showing the "hum bucker" located in front of the power supply module and the ferrous metal shielding on the PTO. In the 1960s, the USAF wanted to reduce the size of the entire DF system so it could be towed around on a trailered hut. This meant the radio-goniometer had to be in the same room as the receivers. This was going to require some protection to certain receiver circuits. The R-390 had been out of production for several years, so the solution was to design the new portable system to use modified R-390A receivers that could be easily purchased. Arvin Industries was the main contractor with Servo also doing some rework. The modified receivers would have the Series 500 IF module, essentially a R-390 IF module that was slightly updated to not require any rework to the R-390A receiver it was installed into. That eliminated the mechanical filter phase shift problem. Additionally, with the close proximity to the radio-goniometer, a 60hz hum appeared on the PTO tube filament and that also interfered with the LF modulation of the DF system. 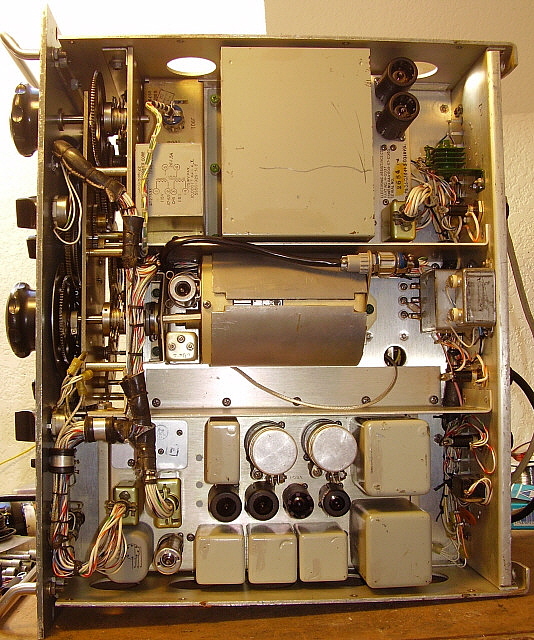 A special "hum bucker" chassis was added to the receiver that essentially operated the VFO tube, the BFO tube and the 3TF7 Ballast tube on +25vdc. Also, a grounded ferrous metal shield was added to the PTO housing to prevent hum "pick up." Arvin bought new R-390A receivers in 1967 direct from Electronic Assistance Corporation and the modifications were installed at Arvin. 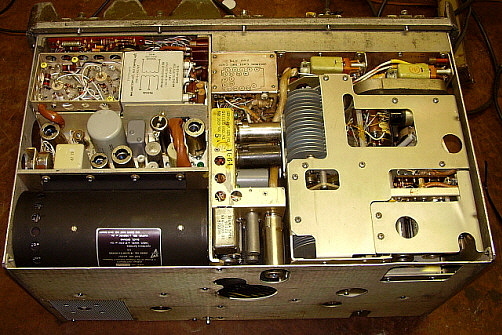 When complete, the receiver was tagged as "R-725/URR." The tags will generally show Arvin Industries as the contractor but sometimes Servo Electronics will be encountered. Arvin ink-stamped a serial number on each Series 500 IF module and when that module was installed into the receiver that same serial number was stamped onto the front panel data plate. The Secret Project - Was there another purpose that was the "real" reason that the R-725 was created? According to an article that appeared in Electric Radio in January 2006 by Chuck Teeters, there was a "top secret" purpose for the R-725 and the receiver "mods" were primarily created for that "secret" project. The R-725 was a product that resulted from the Cold War jamming that was common between the USA and the USSR. In the mid-to-late 1960s, the NSA, the USAF and the Signal Corps were developing a new system called "Tropicom" that was an upgrade to the antennas and transmitters to improve HF communications for the military. The Tropicom upgrades also included the incorporation of the "F9c" anti-jamming/crypto system. The F9c system used a spread spectrum transmission of digital noise and signal that ran through a digital encrypo-key generator that had 144 stages of looped-feedback that also fed through phase modulators to maintain proper phase relationships of the signal and noise. When recombined at the receive end the signal to noise extracted the signal and left the noise and any jamming attempts far below the signal level. Since the system used spread spectrum, the signal couldn't be detected without the proper combination of equipment and decryption and that left any jamming attempts at just "blind" shots. However, when the F9c was used with a R-390A on the receive end, the phase changes in the mechanical filters interfered with the recombination process and the system didn't work. When used with R-390s with a standard IF amplifier circuit, the F9c system worked fine. Since the R-390 receivers dated from the early-1950s, there were only a limited supply of those receivers still available and those that were available needed constant maintenance. The ultimate solution was to have new R-390A receivers with newly-built R-390 IF modules installed available for the Tropicom system. In order to keep the F9c project "secret," the actual use of the R-725 couldn't be known to those outside the Tropicom project. Since there really was the Adcock DF system upgrades that really did need a non-mechanical filter type R-390A, the R-725 was directed to be built for the DF purpose only. However, those running the F9c project had the R-725 order quantity doubled and half of the R-725 receivers were procured for F9c use while the other half went to the DF systems. The secret classification stayed on with the F9c system and it was used for quite a long period with many upgrades over the years. So, even though half of the R-725 receivers were used in direction finders, the other half had a "secret life" used in the anti-jamming/crypto communications world of the NSA, the USAF and the Signal Corps. Performance - The R-725/URR is very much like listening to a R-390 receiver. The modifications to the VFO-BFO heaters using the "hum-bucker" are not audible. The big change is the Series 500 IF module. With six IF amplifiers, the R-725 has plenty of gain. So much, that most strong signals will push the Carrier Level meter to 70db or 80db and then if the receiver is tuned off of the signal, the meter drops to 20db or less. I have the IF gain reduced by 40%. Audio sounds slightly different than the R-390A with mechanical filters but still there is lots of selectivity and QRM is not a problem. The R-725 is basically like having an R-390 without all of the maintenance headaches. The AN/PRD-1 was a portable direction finder set that consisted of a R-395 receiver, a DY-79 dynamotor, a CY-947 battery box, a MT-870 tripod mount, an AS-536 combination loop and sense antenna and an AT-301 sense antenna extension. The entire set could be packed into four wooden crates for transportation. The PRD-1 could be mounted to a Jeep for portable operation or it could be transported to and used "in the field" mounted on its tripod. When mounted in a Jeep the +24vdc battery system of the Jeep powered the DY-79 that then powered the R-395. When the PRD-1 was operated in the field there were two power options available. The provided 50 ft. power cable allowed connection to the Jeep's +24vdc power with the PRD-1 set-up in the field. The other method was to not use the DY-79 but to instead use the CY-947 battery box that provided the necessary R-395 voltages via dry cells. The voltages necessary were +1.5vdc filaments, +6.0vdc tube heaters, -6.0vdc bias voltage and +87vdc plate voltage. Most of the tubes used in the R-395 are low current battery receiver tubes, e.g., 1U4, 1U5, 3Q4, but there are a couple of six volt cathode tubes used also, 6AK5 and 6C4. The CY-79 dynamotor box also has some electronic circuitry that uses two ballast tubes, two 12AU7 tubes and one 6AK5. When using the CY-79 to operate the R-395, a 6 volt "lantern battery" has to be installed on the dynamotor chassis. This battery supplies the -6.0vdc bias voltages. When the complete PRD-1 "in the crates" was available then cables, headsets, spares, set-up compass, locating stake and many other odds and ends were included. Initial contracts were in 1951, 1954 and 1955. The R-395 is a fifteen tube, double preselection, single-conversion superheterodyne that tunes 100kc to 30mc in seven over-lapping bands. It was designed to receive CW, AM or MCW (or ICW) modes on all seven bands and to also receive FM signals on Band 7 (12.5mc up to 30mc.) The circuit utilizes two IF sections, a 455kc IF for all bands except Band 2 which uses 1610kc for the IF. FM IF is 455kc but uses different 455kc IF transformers that utilize the 1610kc IF tubes. A dial mask provides "band in use" viewing along with an opening for viewing the logging dial. The meter will read the various battery levels and also signal strength in the IND position. When MONITOR is selected, the loop antenna is disconnected and only the vertical sense antenna is used since it is omni-directional. The DF position connects the loop to the input of the first RF amplifier and the sense vertical to the input of the sense amplifier stage. The sense amp output is then routed back to the first RF amplifier input. The first RF amp output is combination of the two antenna responses. ANT TRIMMER and DIAL ADJ (index) controls are provided. The SENSITIVITY control also has an AVC (on) position that can be utilized for general listening in the MONITOR mode (non-DF.) AVC should be turned off for DF purposes and only the minimum amount of RF gain used for accurate bearing indications. Strong signals tend to be rather broad and are more difficult to DF accurately. Audio output is 600Z ohms and designed for headset although the R-395 will drive a 600Z ohm speaker quite well. When operating on the DY-79 dynamotor, the current required is around 7 amps at +24vdc. photo above: Close up of the R-395 receiver and the DY-79 dynamotor box. Note the "red" and "white" scales on the loop compass. photo above: The AN/PRD-1 set up on the MT-870 tripod with the DY-79 dynamotor and the R-395 on top. The AS-536 loop antenna only requires the loop extension AT-301 on Band 7, so it isn't installed. The shop ceiling is nine feet high and there is about one inch of clearance with the top of the loop (without AT-301 installed.) DFing Objectives - The object of using the PRD-1 was to determine a true bearing of a signal from an unknown location. That signal could be friendly but more often it was from an enemy transmitter. Generally, these signals were not very strong and were only transmitted for very short time periods. The R-395 has ample sensitivity to detect very, very weak signals, not for DX purposes, but for locating nearby, weak, enemy signals. It wouldn't do much good to determine the bearing of a strong signal located 1000 miles away. The PRD-1 was for finding enemy transmitter locations that were nearby. In fact, it's direction finding (DF) works best with ground wave signals. Sky wave propagation tends to adversely affect DF accuracy. By adding a second DF location (some distance from the first) allowed for "triangulation" to determine the exact location of the enemy transmitter. The direction bearing had to be determined quickly since most enemy transmissions were brief. Additionally, sometimes enemy transmissions were simultaneously sent from two different locations to confuse the DF process. Also, high angle-of-radiation antennae were sometimes used to "force" skywave propagation in an effort to thwart DF accuracy. Determining True Bearing of a Received Signal - The receiver has to be set-up in the field so that it is oriented to North and South correctly so that the degrees indicated on the loop compass accurately represent azimuth positions. The tripod has to be leveled using the bubble-level in the accessory compass. Then the compass (indicating magnetic N) and stake allowed operators to "sight" the stake driven in the ground 150 feet from the receiver. The compass was then removed and the receiver and dynamotor were installed onto the tripod. The loop was rotated to read 90 degrees and then "sighted" to the stake out 150ft. The loop compass could be adjusted by loosening the locking thumb screws and rotating just the degree wheel to the correct indication. If "true North" was required for bearings then the magnetic deviation for the particular area had to be known. Magnetic deviation varies all over the earth and can be a number of degrees east or west of the theoretical magnetic North. Charts provided the users with the correct deviation for the area of use. From this figure and theoretical magnetic North, "true" North could be calculated and adjusted into the loop compass. At this point, the PRD-1 was ready to accurately measure true direction of a received transmission. The loop antenna in combination with the vertical sense antenna allows the PRD-1 to determine "true direction" of a tuned signal. The loop antenna alone will respond to a tuned signal in a "figure 8" pattern that is in-line with the axis of the loop to provide the strongest response. By adding a vertical "sense" antenna within the field of the loop, the "figure 8" pattern is modified to be a cardioid pattern with the strongest response being from one lobe of the loop in the direction of the signal's location. However, a more accurate method used by the PRD-1 was for the operator to first rotate the loop for a null in the signal. Then, the indication in degrees on the white scale of the antenna compass is noted and the loop rotated +90 degrees (with the white scale numbers increasing.) This will result in a stronger signal response. Then, while noting the meter reading, the operator would switch to WHITE and then switch to RED while noting the meter reading changes. Which ever reading was the lower then the true bearing would be indicated on that color scale on the loop compass. Loop Antenna - The AS-536 is a combination loop antenna that is a "diamond" shape and a vertical sense antenna that is in the center of the loop field. The sense antenna has an adjustable section that allows for completely "folding up" the loop assembly for packing and portability. When setting up the AS-536, the height of the sense antenna is adjusted for best fit of the loop ends into the antenna compass receptacles. Each side of the loop is three feet long. The AT-301 is a three foot extension for the top of the vertical sense antenna. AT-301 should only be installed if the intended operation is on Band 7, that is, 12.5mc to 30mc. Tripod - MT-870 was used when the PRD-1 was set-up in the field. Its height is adjustable by lengthening each leg or by the angle of the three legs. When in dirt, the pointed ends will "dig in" and prevent movement of the legs. On floors or hard surfaces, the pointed ends will slip and the tripod won't stay at its correct height. Note in the photo to the left, I've installed some 14 gauge wires that allow the legs to only spread out to 24 inches. This provides a positive limit to the "leg-spread" and prevents the tripod from moving once the DY-79 and R-395 are installed. The DY-79 is mounted to the top of the tripod using a threaded rod with attached handle. The R-395 is clamped to the top of the DY-79 with four bale clamps. Performance - I'm operating this PRD-1 with a +25.5vdc 10A power supply via an original power cable (two 14ga and two 10ga with shield.) Set-up is in the shop. The first test was during the day and consisted of tuning in local AM BC stations, 40 meter hams (on SSB) and some Shortwave BC stations. In MONITOR position, all stations were received well. In DF, the position of the loop could enhance or reduce tuned signals as desired. On medium wave, FCH 342kc, CC 335kc and MOG 405kc were tuned in. DF provided lower noise than MONITOR since the sense vertical alone responded to noise. During the night, I tuned in 23 NDBs in about 25 minutes of listening. Best DX was DDP 391kc in San Juan, Puerto Rico and QD 284kc The Pas, MB, Canada. The advantage of the PDR-1 was the ability to immediately adjust the loop to null noise or to enhance signals. Also, "blowtorch" NDBs could be nulled to allow copy of other weaker signals. This really isn't what the PRD-1 was designed for but it does show that the R-395 is sensitive and that its DF capabilities do work, even with sky wave propagation. The Technical Materiel Corporation was founded by Ray DePasquale in the mid-1950s to provide commercial and military-grade communications equipment along with high-quality communications receivers for radio amateurs. 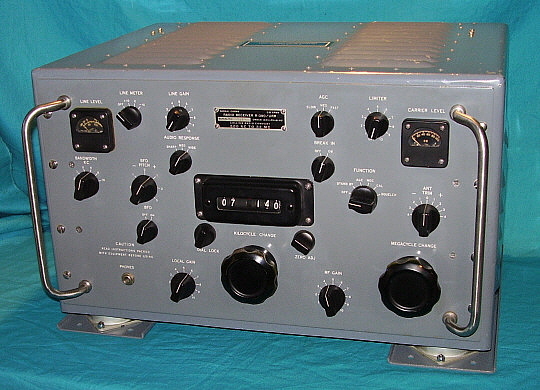 TMC's most popular product (along with the CV-591 SSB Adapter) was the GPR-90 receiver that was produced from 1955 up to about 1962. It was a $400 to $500 receiver that was primarily designed for use by hams. Within a short time, the military decided that they too wanted some GPR-90 receivers with some variations to the design. The military wanted TMC to add a separate crystal oscillator (HFO) with ten selectable crystal-controlled channels to the GPR-90 along with changing the antenna input impedance from selectable 300Z ohms or 75Z ohms to a fixed 75Z ohm input. The first RF amplifier was also changed to a standard tuned grid input rather than the grounded grid input used in the GPR-90. Additionally, inputs for an external LO and external BFO was provided. These receivers were designated as GPR-90RX. TMC also built a diversity version of this receiver that provided accessible Diode Load and AVC lines for interconnecting two (or more) receivers for diversity reception. These receivers were designated as the GPR-90RXD. There was also a GPR-91RXD that provided a 15kc selectivity bandwidth for four channel independent SSB reception or multiple channel RTTY reception (the GPR-90RX[D] had a 7kc bandwidth.) The military versions also had military designations with R-825/URR used for the GPR-90 and with the RX and RXD(?) versions usually identified as R-840/URR. All of the GPR-90 receivers are double preselection on all bands (two TRF amplifiers) and dual conversion on the top three bands (5.4mc to 31mc) with the first conversion at 3.995mc and the second conversion at 455kc. Three IF amplifiers are utilized and the Detector is a standard envelope type using a 6AL5 dual diode tube. Audio output uses a single 6V6 tube and the output transformer provides 4, 8, 16 and 600 Z ohm impedances. 15 tubes are used in the GRP-90 while 16 tubes are used in the RX and RXD versions (adding the 6AG5 Selectable Xtal Oscillator.) A matching loud speaker was available for the GPR-90 receiver. All RX and RXD versions were rack-mounted receivers. The BFO circuit in the GPR-90 receivers is lightly coupled with only a few pico-farads of capacitance to prevent "masking" of weak CW signals. This, in addition to the standard envelope detector, makes reducing the RF gain control necessary for proper signal to BFO injection ratio for either CW or SSB reception. For improved SSB reception, TMC offered a "GPR-90 matching" table-top SSB adapter, the GSB-1. It's also possible to use the rack-mounted CV-591 SSB adapter with the GPR-90 receivers. 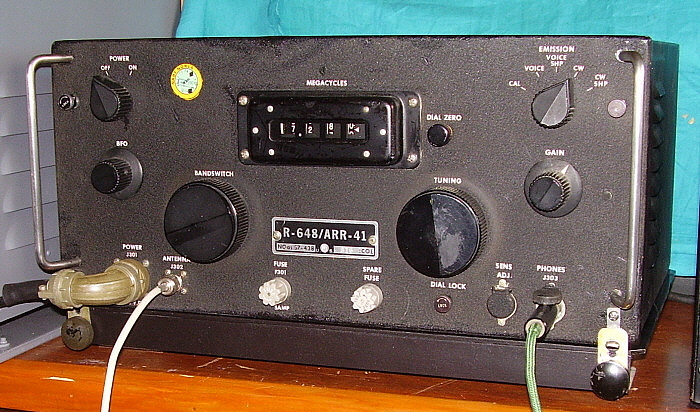 Some of the rack-mounted SSB adapters were designated as "MSR" units (Mode Selector - Receiving) and these are similar in design, appearance and use to the CV-591. The GPR-90RXD manual specifies that the MSR-6 can be used for enhanced SSB reception. See section below on the TMC SSB Adapters. In 1963, the GPR-92 was introduced but only 115 were built before the model was discontinued. TMC continued to expand in the 1960s with several companies located in many different states (Mamaroneck, New York is the headquarters location.) TMC provided the military with several types of transmitters and other types of communications equipment. Eventually, Neil DePasquale (Ray's son) began running the company. While all of their competition either went out of business or were purchased by other companies, The Technical Materiel Corporation is still in business (although sparsely staffed) and is still run by Neil DePasquale. The GPR-90 has a varied reputation based on the many subjective reviews that abound on the Internet. It's easy to find conflicting reviews about the receiver with some users rating the GPR-90 as an excellent performer while others feel the receiver is not up to TMC quality in either performance or construction. There was a tendency by many to compare the GPR-90 to the Collins R-390A receiver but the two receivers couldn't be more diverse in either design or selling price. Consider that the R-390A sold for well-over $2000 while the GPR-90 was $495. Even the GPR-90 manuals warn users that if they want "frequency meter" accuracy then they should buy a "frequency meter" and not ask the receiver to "double as both." Certainly a statement that illustrated TMC's frustration with comparisons of the GPR-90 to Collins' "frequency accurate" tuning systems. A fair comparison of the GPR-90 would be to the Hammarlund HQ-180 receiver. Both receivers were basically contemporaries and sold for about the same price for the same intended end-users. There's even a similarity in both receiver's tuning drive systems (rim-drive pinch-wheel) and in their front panel layout of using two dials separated by the S-meter. Interestingly, all reviewers rate the GPR-90 audio as "excellent." The GPR-90RXD version does perform somewhat differently than the standard GPR-90 since it has a fixed 75Z ohm input and has other changes within the chassis for diversity reception and other various purposes. Still, the RXD is very sensitive and has probably the best Crystal Filter circuit of the time (so does the standard GPR-90.) Dial accuracy is very good considering that it is an analog readout that is limited by its resolution. Proper alignment is critical in many receiver designs and certainly the GPR-90s will perform best when in good condition with no defective components and with a fresh IF/RF alignment. >>> All of the TMC SSB adapters work in a similar manner. The adapter circuitry down-converts the incoming IF from the receiver, 455kc for example, to a lower frequency (17kc) and then mixes a BFO to provide product detection. Bandpass and Low Pass LC filters were utilized to increase selectivity. A crystal-controlled oscillator is used for the first conversion (receiver IF to 17kc) and also a VFO called "bandspread" (manual select) is provided. Crystal frequencies are 17kc above and below the IF to provide selectable Upper or Lower sideband. Sideband selection uses a push-button that actuates a selector relay which also operates the "U" and "L" lamps accordingly. The AVC circuit operates on the incoming signal from the receiver and provides a fairly constant level of signal and has selectable fast and slow AVC action. Audio output is 8.0Z ohms or 600Z ohms from a single 6AQ5 tube. Although specifically for SSB reception, CW signals can also be received. Also FSK can be received. Additionally, the ability to select the upper or lower sideband of an AM signal or to receive an AM signal in the "exalted-carrier" mode (AM + BFO) is available. Exalted carrier reception usually improves weak, difficult to copy AM signals. There are several remote operation options available including remote sideband selection or detection along with remote BFO operation and tuning. Some versions were specifically designed to utilize remote inputs from specific TMC-built receivers. Once connected to the particular receiver, if only the SSB converter audio output is utilized then the user will not have the availability of the receiver's circuitry down-stream from the last IF stage, usually the noise limiter and the receiver's audio output circuitry. Two separate speakers can be used with one connected to the standard receiver audio output and another speaker connected to the SSB adapter's audio output. With the dual speaker set-up, the user can choose the receiver's audio output for AM signals (probably better fidelity) and the SSB adapter's output for SSB or CW signals (virtually distortion-free SSB.) Single speaker operation can be achieved by paralleling the adapter's 600Z output with the receiver's 600Z output (Z is then 300ohms.) Then connect 4.0Z ohm speaker to receiver's 8.0Z ohm tap. TMC offered the CV-591A and CV-657A (and many other variants) for the military. The CV-591A utilized 455kc IF input while the CV-657A utilized 200kc. The MSR series went from MSR-1 thru MSR-9. MSR-3 utilized 200kc IF input while the MSR-8 utilized 500kc IF input. All other MSR numbers utilized 455kc IF input. The MSR-1 and MSR-4 are also considered CV-591A units. The NC-400 was introduced in 1959. It was obvious from the astounding list price of $895 that the intended customers were going to be commercial users along with military and government purchasers. 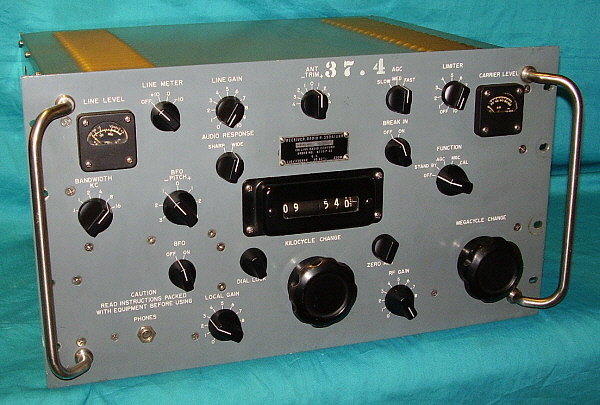 Many of the features of the NC-400 were necessary for commercial-military applications but weren't required by the ham users. The five, selectable, fixed-frequency, crystal-controlled receiving channels or the diversity options were certainly for military or commercial use. The crystal-controlled BFO option or the IF output (both for RTTY) were other features not normally found in a ham receiver. Production estimates vary widely - from a low of several hundred receivers up to perhaps as high as 1000 receivers. Probably less than ten percent of production went to the "well-to-do" hams and SWLs who could afford the "stratospheric" price. The remaining receivers were sold to commercial and government users. Among the more commonly mentioned government users is the FBI where the receivers were installed in some field offices for various purposes. Certainly other government users and the commercial users found the NC-400 filled their requirements and the exorbitant price was paid either by tax-payer dollars or company requisition funds. The NC-400 was available up to about 1963. 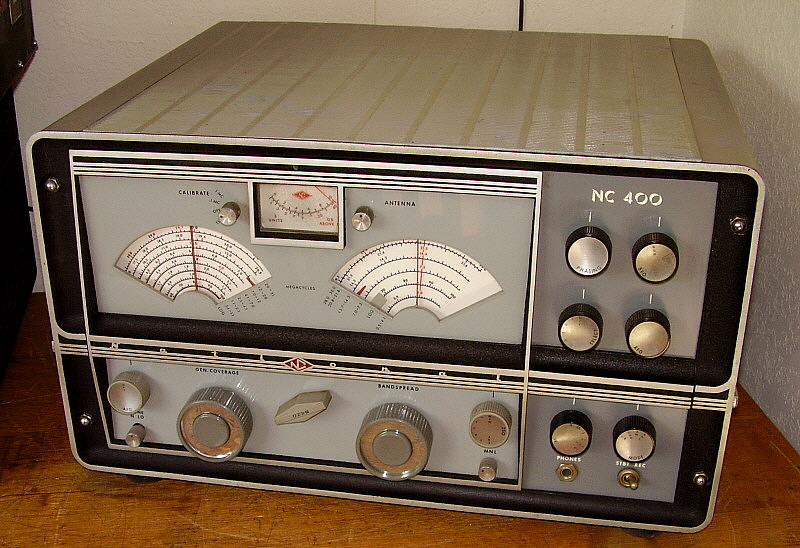 Today, many vintage ham gear enthusiasts tend to believe that the NC-400 was "over-priced, over-rated and used cheap parts." Another common opinion is that the NC-400 is one of National's worst-looking creations (if you think the NC-400 is ugly, you should see the matching loudspeaker, the NTS-2.) However, the NC-400 can perform quite well if it's in good condition and aligned. It has sensitivity and stability that was competitive with any of the communication receivers of the time. However, sensitivity isn't all that's required for reliable radio communication. National wasn't alone in producing a tuning dial system that couldn't resolve the tuned frequency "to the kilocycle" as Collins equipment could. The NC-400 dial resolution is vague and if you have the optional crystal calibrator you can then find markers on 1000kc or 100kc but most of the scale index markers are in 10kc increments so anything more accurate than 10kc is just guesswork. Some of the parts used for the NC-400 seem inconsistent with the high selling price. Most of the knobs appear to have been "leftovers" from old National televisions with these knobs pushing onto half-shaft controls. The knob nomenclature is so miniscule as to be unreadable except under magnification. Sometimes the S-meter scales will have a "spotty" appearance when illuminated. Out of the cabinet, the chassis seems somewhat flexible and that can't be good for alignment - which has to be performed out of the cabinet. The front panel and cabinet design must have been conceived by an interior decorator since the paint scheme uses three different shades of gray in both smooth and wrinkle along with black winkle finish with chrome trim strips on the sides of the cabinet. Then there are both gray knobs and black knobs along with four small aluminum knobs. National's advertising artwork never flattered the NC-400 and, for some reason, the receiver is just not photogenic. It will always look better "in person" than it does in photographs. If you are an owner who finds the NC-400 is just too homely to look at, you can always listen to the receiver with the "lights out" - just kidding! If you're planning on rebuilding a NC-400, luckily most of the capacitors are ceramic disks which don't require replacement. There are a handful of plastic molded paper dielectric capacitors. These are the later Sprague capacitors with a black body and yellow nomenclature. These tend to be more reliable than "black beauties" but still, they are paper dielectric and probably should be replaced. The multi-section electrolytic uses four capacitors. Three are power supply filters and one is the cathode bypass for the 6AQ5. There are new-manufacture multi-section capacitors available that have the correct values (made by CE using original Mallory machinery - available from www.tubesandmore.com) and are an exact fit mechanically. If the 4H4C current regulator is open, it can temporarily be replaced with a 6V6 tube. The 6V6 heater provides the correct voltage drop for the 6BZ7 LO tube and since only the heater is required, the 6V6 doesn't even have to test good, just have a good heater. Although using the 6V6 as a 4H4C substitute will allow the receiver to function you'll probably notice that the receiver drifts more, especially noticeable in CW or SSB. The 6V6 heater can't respond to slight voltage changes as fast as the 4H4C does, thus the noticeable drift with the 6V6 installed. 4H4C regulators are not hard to find and the price is around $15 to $25. Carbon resistors should be checked for value although this isn't usually a problem. Test all tubes on a quality tube checker and replace any that don't check "as new." Do not substitute any other type of tube for the 6BZ7. Lab-quality test equipment is required for a proper alignment after which your NC-400 should be performing its best. When it comes to the alignment,...well, it's not technically difficult but it is cumbersome and awkward to have to perform the alignment with the receiver on its side. You'll find the upper end trimmers will be under the chassis on one side and lower end inductance adjustments are on top of the chassis on the opposite side. Several of the inductance adjustments are located under the tuning condenser assembly. National did provide access to these adjustments by locating them in the gaps between the condenser sections. When all of the adjustments for RF tracking are completed, then the receiver is returned to its right side-up position, which tends to flex the chassis a bit. You'll generally find that the alignment will have changed slightly with this position manipulation. Operation of the band switch seems to also affect alignment on the upper bands. Repeating the alignment of the LO on the upper bands several times seems to settle-out the change and the alignment will generally stay pretty close after that. Why National didn't provide for all alignment adjustments to be accessed from the top (like their competition was doing) is a mystery, especially since National wanted commercial and military users to purchase the NC-400. Also, there are two alignment errors in the National NC-400 manual. The location of L-11 is not shown anywhere (bottom of the crystal filter) and when performing the 1720kc conversion adjustment the instructions don't tell you to change bands up to the dual conversion range. As expected, ownership and actually operating the NC-400 goes a long way toward overall appreciation with its performance at the forefront. The NC-400 can pull in signals quite well, especially after a careful alignment. The audio quality is a pleasant surprise considering it's a single-ended 6AQ5 that's producing the very natural sounding reproduction, however, the Tone switch is not very useful. For the best audio reproduction, don't use the National NTS-2 matching loudspeaker. Use a good quality, large diameter speaker installed in a decent housing and the NC-400 audio will sound great. When you get used to its appearance and its quirks, the NC-400 becomes a fine station receiver. Although many might consider the NC-400 a "ham receiver" because of National's advertising, I have it listed here in the commercial equipment page because most of these receivers were sold to government and commercial users. 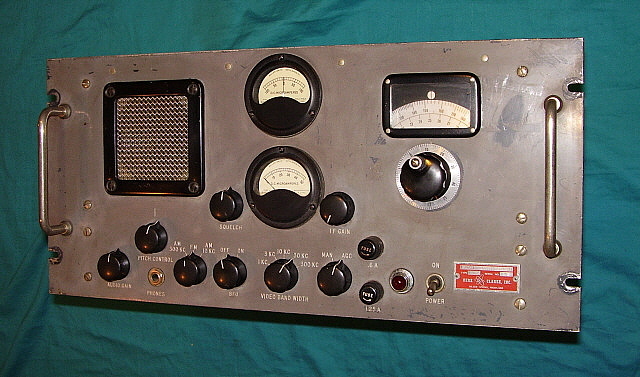 The particular NC-400 (SN: 543 0006) shown above was a commercial receiver that was owned by radio-tv station WHAS in Louisville, KY. Many of the large radio and tv stations would have their own repair facilities and technician staff. It's likely that the NC-400 was in that environment at WHAS since it was obviously used very little. Racal Electronics plc was a British company that was founded by Raymond Brown and George Calder Cunningham in 1950. The company name was derived from the names of the founders RAy Brown and Geo.CALder Cunningham. In 1953, the British Royal Navy wanted Racal to build a couple hundred Collins 51J receivers for RN use. Racal wanted to use mostly British parts but Collins insisted on parts from the USA. After an inspection of the (then) small Racal manufacturing facility, Collins refused to license the manufacture of the 51J by Racal. Left with designing their own receiver for the contract, Racal contacted Dr. Trevor Wadley to help with the project. 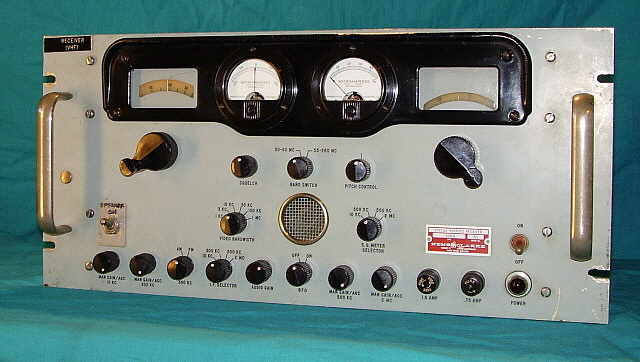 Using a circuit that Wadley had developed in the 1940s for test equipment (and that Dr. Wadley was incorporating into a receiver design of his own,) the "Wadley Loop" was incorporated into the Racal receiver design. The Wadley Loop virtually eliminated frequency drift by using a 1mc crystal oscillator mixing with a MC/VFO and also simultaneously having the 1mc crystal oscillator feeding a harmonic "comb" filter to produce multiple 1 mc harmonics that are used to produce thirty 1mc wide tuning ranges. The "drift cancelling loop" uses the same "comb filter" output but running it through a 37.5mc amplifier, a bandpass filter, then another 37.5mc amplifier and then into a second Mixer. Since Mixer 1 (VFO Mixer) and Mixer 2 (Comb filter mixer) outputs are inverse from each other any drift in MC/VFO is cancelled. 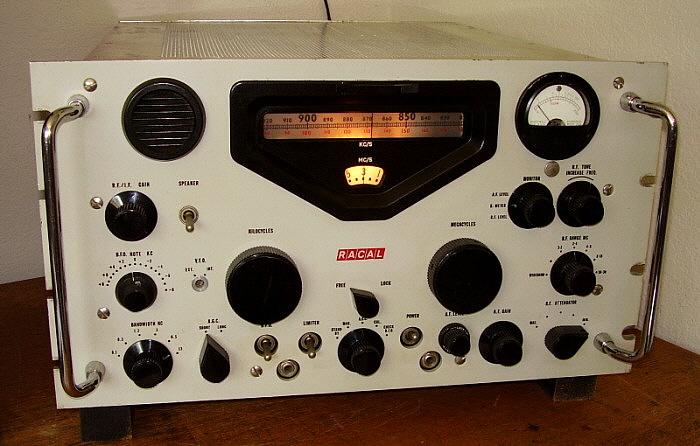 Racal's first receiver was designated the RA-17 and it was the first successful receiver to employ the "Wadley Loop" system for oscillator and conversion stability. The RA-17 was produced from 1953 up to around 1967. As the Racal receivers became more and more popular with commercial and military users, a manufacturing facility was opened in the USA (one of many around the world.) This company was called Racal Communications, Inc. and it was located in Silver Spring, Maryland. Many of the receivers produced in the USA will have either an "A," a "C" or "6" (or combinations) added to the standard model number thus the RA-6117 is the USA version of the RA-117 receiver (the RA-117 was an updated RA-17.) At one time, Racal employed 30,000 workers, was the third largest electronics firm in Britain and had facilities in 110 different countries. After 1966, Ernest Harrison was in charge of Racal. The company also owned Decca, Chubb and Vodafone to name a few of their holdings. Several reorganizations occurred in the 1990s and, in 2000, Thomson-CSF (aka Thalen Group) purchased Racal. The RA-6117 is a 25 tube, triple-conversion superheterodyne using all standard USA manufactured tubes. Most of the hardware is also standard US threads and sizes. US style knobs are used on the RA-6117. The kilocycle tuning dial is a film-strip type that is six feet long and spans 1000kc with a resolution of 1kc. When tuning the receiver, the dial index remains stationary while the numerical dial scale moves behind the index in a linear fashion. The megacycle dial is circular and is read thru the lower window of the dial escutcheon. To readout the tuned frequency one has to add the megacycle dial setting to the kilocycle dial reading. If the megacycle dial is set to 3 and the kilocycle dial reads 868 then the tuned frequency is 3.868mc (as shown in the photo above.) The tuning is super-smooth and very light feeling. The film strip is easy to read to better than 1kc accuracy. The RF amplifier can be switched out if necessary but when in operation it must be tuned to the correct frequency. There is also a step-attenuator provided for coping with very strong signals but still being able to retain the tuned selectivity that the RF amplifier provides. The step-attenuator is very effective at reducing static noise while retaining an intelligible signal. The Noise Limiter is also effective if the static is more severe. Several bandwidths are provided with 13kc being the widest and 100hz being the narrowest. Fast and slow AVC is provided. A three position switch allows the meter to act as an RF signal level, S-meter or Audio level meter. The RA-6117 uses a standard envelop detector - no product detector. Several outputs are provided for External VFO, Oscillator Outputs, 100kc IF Output, several 600Z ohm outputs and a 1W 3.0Z ohm output. A separate audio output (600Z ohm) with an Audio Level control on the front panel that has its own output transformer and operates separate from the standard receiver audio output. This output was for driving a data device, RTTY converter, for example. The small built-in speaker can be switched off if a larger speaker is desired (connecting to the 1W 3.0Z ohm output works best.) Audio reproduction is excellent (with a good external speaker) and Shortwave BC stations that are transmitting good quality audio sound incredible. Sensitivity is first rate but one has to be sure to "peak" the RF amplifier tuning for best results. The receiver is built with a combination of modular and fixed circuit construction all mounted on a large cast-aluminum chassis that has various compartments underneath for circuit isolation and shielding. Some modules are interconnected using coaxial cables with BNC connectors. The RA-6117's superior performance demonstrates why the RA-17 family of receivers were continuously produced from 1953 up to 1967 with only minor changes. 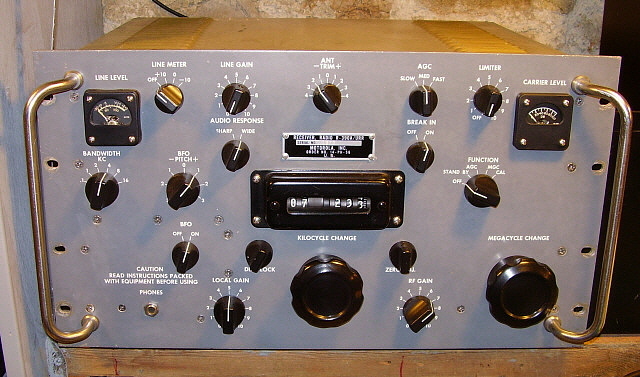 Although the RA-6117 panel is standard 10.5" x 19.0" the receiver's chassis is quite deep at 21.5" which, of course, won't fit into any standard American cabinets. The receiver usually will have its dust covers and, like the R-390A, looks quite nice setting on a table "sans cabinet." Weight is around 67 lbs. The particular receiver shown above was built in 1966. Adding the Optional Remote Standby - The receiver muting, aka remote standby, was a factory option that wasn't installed on this receiver (sn: 193.) There isn't any actual specific data on the standby circuit in the manual other than a basic block drawing that is part of the block diagram circuit flow drawing. The block drawing shows that the B+ going to the Stand By position on the function switch is disconnected at the filter choke and routed to a relay that disconnects B+ and alternately connects a 10K 10W load resistor to the B+ when the remote standby relay is actuated. The voltage for the relay coil isn't specified on the drawing or the receiver schematic but does show that the relay coil is connected directly to the "Receiver Mute" terminals. Apparently, it was up to the end-user to specify what voltage coil the relay would be used. Since I didn't want to have to supply a separate voltage to "mute" the receiver, I chose a very small Potter-Brumfield sealed relay that was 4PDT and had a 115vac coil that only needed 10mA to actuate the relay. I tied all of the four NC, NO and ARM contacts together for maximum current carrying capability. I made a small bracket to mount the relay at the top-rear of the chassis near the terminal strip (making use of existing holes.) The wires from the relay were routed thru an existing chassis hole (that was located directly under the relay) to the receiver power supply section. I desoldered the wire (B+) connected to pin 2 on L80, the choke. I added an extension wire and this was connected to the NC contact of the relay. A wire from the ARM of the relay was then soldered to pin 2 of L80. Then a wire from the NO contact was connected to the junction of the 10K 10W load resistor and white-yellow wire from S5 (standby position.) One Mute terminal was connected to one relay coil terminal. The other relay coil terminal was wired to 120vac at the downstream side of the fuse. The second Mute terminal was wired to the 120vac neutral at the power transformer terminal. Shorting the two Mute terminals completes the 120vac circuit and turns on the relay which disconnects B+ and connects it to the 10K 10W load resistor which puts the receiver in standby. The manual selection of "Standby" with the function switch is not affected by this addition. This remote standby actuation is somewhat different than the standard NC-receive/NO-transmit action with a NC action on the Mute terminals required during transmit. This is somewhat like the R-390A "Break-in" function which also requires NC on transmit. Most T-R relays provide contacts for both NC or NO on transmit functions so no problems should arise with this remote standby addition. The Remote Standby addition makes the RA-6117A an "easy to use" station receiver that provides excellent signal reception along with an impressive bench presence. Siemens is a very old and very large German conglomerate that manufactures many different types of products. The company was founded in 1847 by Werner von Siemens and Johann Halske to sell their non-Morse-type telegraph system. The Siemens telegraph was installed in many locations throughout Europe. Siemens continued to grow through the nineteenth century adding electric trains and light bulbs to name just a few types of products offered. Many varied companies were added to the Siemens conglomerate during the twentieth century and, even today, Siemens continues to add new products, including medical equipment, to the conglomerate. Siemens employs over 300,000 people world-wide and is a major supplier of medical equipment and many other types of products. The Siemens E-311-E1 was produced from 1959 to 1961. It's a seventeen-tube, triple-conversion superheterodyne that tunes from 1.5mc up to 30.0mc in five tuning ranges. The IF conversions are a tunable 1300kc to 1400kc IF followed by a 370kc IF that can be tuned by an interpolator and finally a fixed 30kc IF. The receiver is comprised of seven modules that interconnect although some hard-wiring is also used. The modes receivable are A1(CW,) A3(AM) and A3a(SSB.) When AM is selected the receiver automatically shuts off the BFO and uses different filters for 6kc-wide DSB-AM reception. When SSB is selected the BFO is automatically turned on and the Sideband selection switch enabled allowing the user to select USB or LSB. The meter can read either audio output or RF signal voltage. The selectable IF bandwidths are only available on CW or AM and are 3.1kc, 1.5kc, 0.5kc and 0.15kc for CW and 2X for AM. SSB bandwidth is fixed at 3.5kc. Two time-constants of AGC are provided, 2.0 sec decay and 0.2 sec decay. The built-in speaker can be turned off by pushing in the AF Gain control to actuate the switch. An external loudspeaker (5Z ohms) can be connected via the front panel phone jack. 600Z ohms is also available via a front panel phone jack as is the headphones jack. A Noise Limiter control is also provided. A Squelch control is also provided but, since it's a carrier-operated circuit, it only functions in the AM mode. The front panel nomenclature is bi-lingual in that both German and English indicate control function. Extreme dial accuracy is provided by dual frequency indicators. The arc-dial reads megacycles while the vertical dial reads kilocycles. If the 100kc SYNC circuit is turned off then the receiver can be coarse tuned using the left-hand tuning knob. With the 100kc oscillator set to SYNC then the coarse tuning has to be set to a 100kc position where the 100kc "lock" lamp indicator will stop blinking and turns on continuously indicating a 100kc frequency "lock." Then the Fine Tuning knob will tune that 100kc bandwidth via an interpolator circuit tuning the second IF providing an accuracy of 100hz on the KC dial. For example, if 14.100mc was set on the Coarse tuning (and in lock) then the Fine tuning would tune from 14.100mc up to 14.200mc. Each 100kc part of the spectrum selected by the Coarse tuning will be tuned by the Fine tuning when in 100KC SYNC. If extreme accuracy isn't necessary or if wide coverage of the spectrum is desired then the Sync can be set to OFF and then tuning can be accomplished with the Coarse tuning with the Fine tuning set to 00. Since extreme accuracy was necessary in some applications, the 100kc oscillator and the Interpolator oscillator operate in special oven temperature-controlled ovens. Green indicator lamps show if the ovens are powered. When the ovens are at temperature the green lamps cycle "on and off" as the temperature is maintained. The Calibrator provides a 400kc marker that corresponds to special markers on the megacycle dial. There was an optional 1kc spectrum oscillator that functioned like the 100kc SYNC and provided a 1kc marker for extreme accuracy in determining actual frequency of a received transmitted signal. The 1kc spectrum oscillator is not installed in the "E1" version of the receiver. Performance Notes: The E-311-E1 is an unusual receiver that has impressive sensitivity and excellent dial accuracy. "Locked" tuning can be cumbersome due to the 100kc tuning range limitations but one can always "random scan" the entire selected tuning range using "Unlocked" Coarse tuning. I find that "unlocked" is best for SW BC listening since I can cover the entire SW band quickly. SSB reception is very good although the fixed 3.5kc bandwidth might be a problem in a crowded band. I've only experienced SSB QRM that made copy difficult once, so 3.5kc works fine most of the time. CW has bandwidths available down to 150 cycles, so no problems there. 1.5kc bandwidth works best on CW most of the time. AM is actually quite good since the bandwidth "doubles" so the 3.1kc bandwidth is actually 6.2kc. AM signals sound very good. I am using a separate loudspeaker that is 10" diameter (4Z ohms) and the reproduction is better than the panel speaker for most reception. Unfortunately, there's no remote standby provided and using the E-311-E1 as a station receiver requires good antenna input isolation during transmit (like a Dow-Key) and manually reducing the RF gain. Allen Clarke started in the electronics design business in the 1940s and by 1951 had a small electronics design business. NEMS was an acronym for National Electric Machine Shops, a name chosen by NESCO, National Electric Supply Company, when they incorporated in 1937. NESCO goes back to 1899 and the company was involved in radio manufacturing very early with many contracts assigned to them in WWI and after. NEMS and Clarke merged in 1955 as Nems-Clarke - specializing in high-end commercial-military radio equipment. All (?) Nems-Clarke receivers operate in the VHF and UHF part of the spectrum that was then being used in part for telemetry from some kinds of missiles and for other military and quasi-military purposes. Later Nems-Clarke receivers monitored Russian missile launch telemetry. The 1302 Special Purpose Receiver is a VHF AM/CW/FM receiver that utilizes a Western Electric 416A Planar Triode tube in the front end. The 416A operates at a very high temperature and is cooled by a small forced-air blower. The receiver tunes from 53mc up to 262mc in one continuous coverage tuning range with a 0 to 35 scale for logging. The tuning dial is not illuminated. Behind the grille on the left side of the panel is the built-in four inch speaker. The 1302 was designed to operate with a matching Spectrum Display Unit, (SDU) or Panadaptor. The upper zero-center meter is for tuning FM and the lower meter shows relative signal strength and can be used for tuning AM signals or measuring relative FM signal strength. The 1302 was primarily used for surveillance by several different government users. 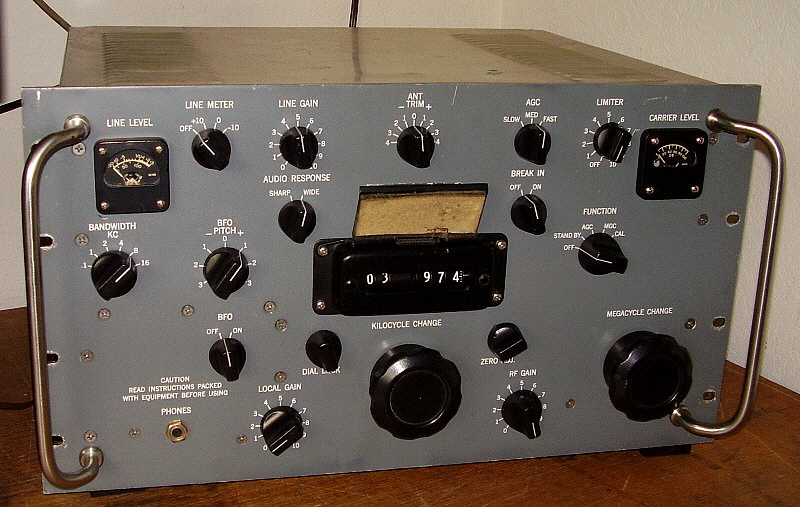 Later versions of the 1302 use a different front-end tube (7007) and are styled more like the Nems-Clarke receiver shown below. Nems-Clarke was purchased by Vitro Electronics in 1957. Nems-Clarke/Vitro continued to produce Special Purpose Receivers for surveillance and telemetry that were used throughout the late fifties and sixties. 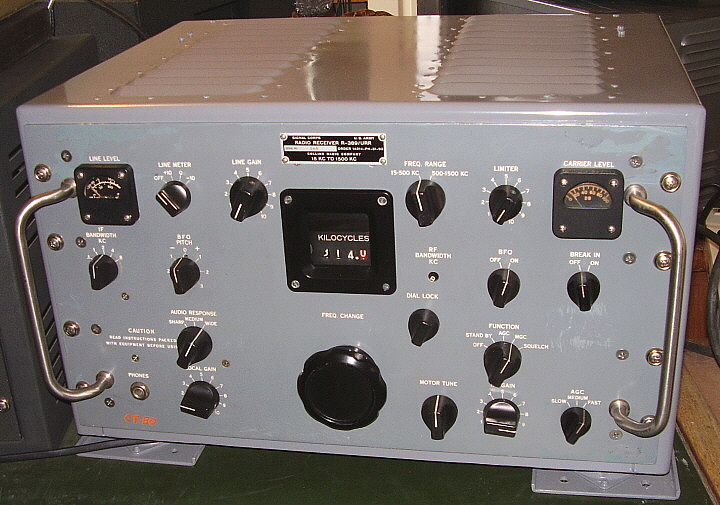 The 1306-B Special Purpose Receiver is a 29 tube AM-FM-CW receiver that was usually operated with a SDU-200-6 Spectrum Display Unit (panadaptor.) The receiver tunes 30mc to 60mc and 55mc to 260mc with separate dials for each band that are only illuminated when in use. Selectable IF bandwidths, selectable IF AGC/Manual Gain controls, Squelch and a BFO with variable Pitch Control are provided. The zero-center meter provides accurate tuning for FM signals while the right hand meter measures signal strength. The built-in speaker is a very small "communications quality" unit that is located behind the screened cover. A 600 ohm audio line is provided on the rear panel can provide excellent audio quality to a matched loud speaker. The "SPEAKER" switch is a factory modification that replaced a PHONE jack with a switch to silence the panel speaker. Many of the Nems-Clarke surveillance receivers were used to monitor Russian missile launches and analyze data transmissions along with any voice traffic. The 1306-B is a great performer with an impressive appearance. The AN/URR-35 is a VHF-UHF receiver that covers 225mc up to 400mc in one continuous tuning range. The circuit is double conversion with the first conversion at 18.6mc and the second conversion at 1.775mc. The URR-35 is an AM only receiver but it can also receive MCW signals (modulated CW.) It is a manually tuned vacuum tube receiver that also has provisions for a single frequency, crystal controlled fixed-frequency operation. Squelch is adjustable with the controls underneath the right side door. The left side door provides access to the crystal and selector switch. The left meter reads signal level and the right meter reads audio output level. Controls (l. to r.) are Manual Tuning, Dial Lock, Dial Lamp Dimmer, Noise Limiter, Output Gain, Power ON, Audio Output (standard phone jack under the toilet set cover.) Power input, Antenna Input, Audio Output are accessible via a plug-in rear module that is generally mounted to the rear of the cabinet. Shock mounts are integral to the cabinet and the receiver was usually supplied with a kit for rack mounting if desired. The contract number on the receiver shown in the photo is NObsr57142 probably dating from 1957. The receiver shown was rebuilt at the Philadelphia Shipyard in 1966. Serial number is 792 although the field change record tag on the front panel indicates serial number 1600 (which indicates that the receiver was installed into a different case at sometime.) Other contractors built the URR-35 besides Federal T & R.
Although this is a working URR-35, the 225mc to 400mc region of the RF spectrum is not overly-populated with AM signals. I was of the opinion that the URR-35 was only good for listening to static or maybe a VHF RF signal generator connected to the antenna input of the receiver. Luckily, fellow URR-35 owner Rex, KE7MFW (QTH - Yerington,NV,) discovered that the Fallon NAS uses AM on 318.50 mc for their pilot training exercises. Rex also reports that the receiver is very specific about the antenna used which must present a fairly good 50 Z ohm match. I use an 8" piece of 14 gauge wire inserted into the SO-239 antenna input and this seems to work well on 318 mc allowing me to copy the NAS training exercises quite well (although transmissions are typically sporadic and quite short.) Both Rex and I have also heard some voice transmissions in the 270mc to 285mc region. Transmissions are brief and the length of time "on the air" minimal which means you have to keep tuning around until you happen to find a transmission in progress. Activity is sparse but with patience you'll hear some voice transmissions. For checking reception, there are a number of unmodulated carrier beacons in the spectrum covered by the URR-35 that are "on the air" continuously but without a BFO these are somewhat difficult to hear. I usually can tell they are present by hearing the background noise drop as the carrier is tuned and watching the input or output meters for an indication of tuning through the signal. As to the purpose of the beacons,...unknown. >>> A few changes had to be incorporated into the basic H-500 style, five tube TO. A neon pilot lamp (a power on indicator) was added. The band selector switch information was color coded. Increased shielding was added. The black stag covering was replaced with a brown vinyl oil-cloth covering. Additionally, "USA" was stamped in Signal Corps orange paint on all sides of the cabinet and a metal data plate attached to the front below the latch. This was the R-520/URR "Transoceanic" that was produced for the Signal Corps. About 5000 units were built but by the time Zenith finished the contract and had shipped the R-520s out, the Korean War was over. The Army decided to give a majority of the R-520s to the PXs at various bases around the country. The idea was to rent the TOs out to soldiers for use at their base housing or in barracks. Many were rented and never returned. Some made it the surplus market. Some had the orange "USA" removed along with the military data plate to make the TO look more civilian - especially if it was one that had been rented and never returned. Around 1961, the Army was planning the Bay of Pigs invasion. A contract for special "air drop" cases for the R-520 was issued with a quantity of between 250 to 500 units. These were designated for the R-520 but it's probable by that time the R-520 had been replaced by the R-520A version which was a "militarized" 600 Series TO. The same sort of changes were incorporated into the new R-520A military version with a neon bulb pilot lamp, tube shields, removal of the fold-down log book, no front headphone jack, no dial lamp switch and "USA" was stamped into the back of the chassis. A schematic and instructions were glued to the inside back cover along with two fuse boxes and a Signal Corps TM manual. The black stag of the civilian model was replaced with an olive drab colored oil-cloth type covering and the orange "USA" stamped on the left side of the cabinet. Some will have an orange Signal Corps acceptance stamp on top of the cabinet. This model was designated as the R-520A/URR. It was still the basic five tube TO but, as with all 600 models, this one also had a ballast tube to compensate for low battery voltages. Zenith produced around 3000 units, making the R520A the lowest production TO. 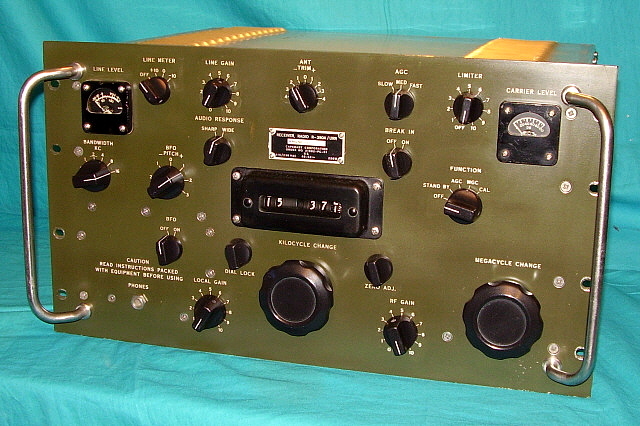 The need for more morale radios in the early 1960s was dubious so its likely that the Army went through the same procedure to make use of the R-520As with the same end results. Many are found today with the orange "USA" removed along with the military data plate, for obvious reasons. There is speculation that some of the R-520A TOs were used in Vietnam but this is only speculation. Certainly, both of the military versions of the Zenith Transoceanic were very low production with only one contract for each model. GENERAL INFORMATION - Around 1951, the U.S. Army Signal Corps needed a portable transmitter-receiver combination that was modern, operated at a moderate power level and could be used outdoors or even deployed via parachute to remote locations. The result was the GRC-19, a set-up that consisted of the T-195 transmitter - an autotune unit capable of around 100+ watts of carrier power - and the R-392 receiver that was based on Collins' the highly successful R-390 receiver. Since the transmitter-receiver had to be portable, it was designed to operate exclusively on +24vdc to +28vdc. Since the GRC-19 was going to be exposed to the weather in many types of open vehicles, the entire system had to be somewhat "weather proof." To allow the receiver to be completely sealed with no ventilation and thus, to have the receiver run as cool as possible, no voltages higher than +28vdc are used in the R-392. 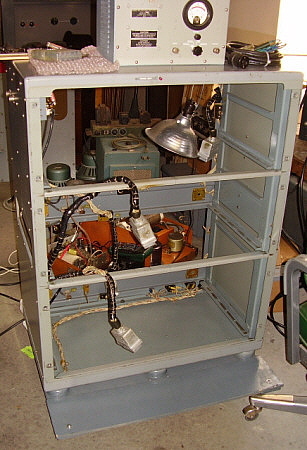 The T-195 transmitter used forced-air cooling for the three external-anode tubes used in the PA and Modulator so an air filter was provided for the intake but this did not "water proof" the transmitter while it was in operation. It was possible to seal the intake and exhaust ports when the transmitter was not in use to aid in the weather-proofing. Additionally, many times the military was going to have to "drop" communications gear from the air, so the R-392 and T-195 had to be "ruggedized" to be able to survive this type of deployment for portable field use (the usual drop was a fully-equipped Jeep that included the radio gear.) The GRC-19 was commonly used on Jeep-type vehicles up to larger "command car" types. A whip antenna was used if operation was going to be mobile but, if the vehicle was going to be in one location for longer than an hour and a half, a dipole antenna was usually erected since power output was much better with this type of antenna. Although generally thought of as an "army radio," the "AN" designation implies "ARMY-NAVY." Additionally, the Air Force had its own technical manual designation (TO 31R2-2GRC19-11) so the GRC-19 was used by all branches of the military for various purposes from the early 1950s up into the late 1970s. 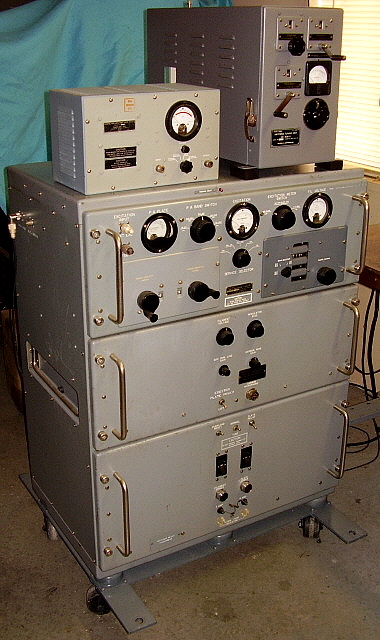 The transmitter for the GRC-19 set-up was the T-195, designed by Collins Radio Co. around 1951. The T-195 is a 100+ watt carrier output transmitter capable of AM, CW or FSK transmission on frequencies from 1.5mc up to 20.0mc. Seven preset frequency channels are available along with a Manual Tuning position that can also serve as an eighth preset channel. The transmitter is built onto a main frame with modules that plug into various Amphenol-type sockets and inter-module contacts to provide power and signal routing. The circuit uses a PTO to generate an oscillating signal that is fed into an Exciter-Multiplier module that mixes the signal to the correct output frequency. As expected from Collins, the PTO and the Exciter-Multiplier are permeability tuned with the Exciter-Multiplier using a slug rack and RF transformers that are very similar in appearance to the R-390A RF transformers. The Exciter-Multiplier has a 5763 output tube that drives the PA module that has a single 4X150D external anode type RF amplifier output tube along with a built-in discriminator circuit to control the automatic Plate tuning of the PA tube. The Modulator module contains the speech amplifier and the push-pull 4X150D modulator tubes and the modulation transformer. The output loading and matching is all accomplished automatically by using a Discriminator module, a Servo Amplifier module, an Antenna Capacitor module, an Antenna Inductor module and the Output Capacitor section that is part of the Main Frame. A total of 21 tubes are used in the T-195 which features complete autotune capabilities and uses a Veeder-Root type of mechanical-digital readout for the transmitter frequency. Modes available were AM VOICE, FSK or CW. Additionally, the T-195 can be set-up as a RELAY station by using the R-392 receiver audio to drive the T-195 audio input and thus "relay" an incoming signal. 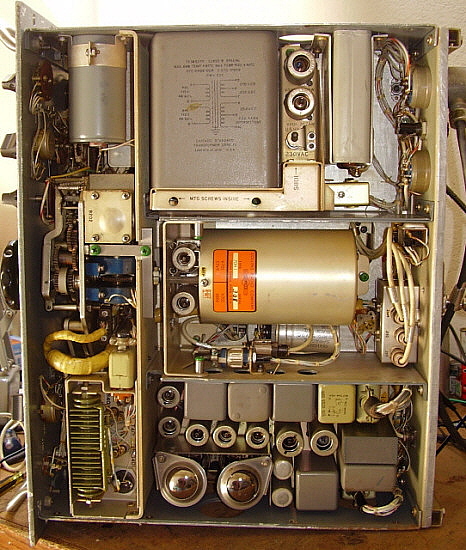 1952 T-195 Transmitter built by Stewart-Warner for Collins Radio Company. This particular T-195 has been upgraded to have the +HV Solid State power supply rather than the original dynamotor. After this modification the transmitter was usually designated as T-195A. T-195 Circuit Details - Inside the T-195 are several small DC motors. Two motors operate blowers to provide forced air-cooling for the three 4X150D external anode tubes used in the PA and Modulator (4X150D - the "D" version must be used since it has a 26.5vdc filament.) Another DC motor is the autotune motor which operates the channel preset frequency selection. The Output Capacitor selection uses a DC motor. There are three AC servo motors (operating on 115vac 400~) to control the loading and tuning operation which is also part of "autotune" in that the T-195 does "automatically tune" itself to whatever antenna load is connected. This "tuning" is accomplished by using a discriminator module that creates error voltages based on phase and load sampling (of the PA) which are then amplified to drive the servo motors. When the error voltages are zero then the transmitter is "tuned" to the antenna load. On early T-195s, two dynamotors are internal to the transmitter with a HV dynamotor providing +1000vdc and a LV dynamotor that supplies three voltages, +250vdc B+ along with -45vdc for bias requirements and 400 cycle 115vac. Additionally, there are several thermo-switches to prevent overheating along with relays and interlocks galore (there are over 15 relays used in the transmitter.) 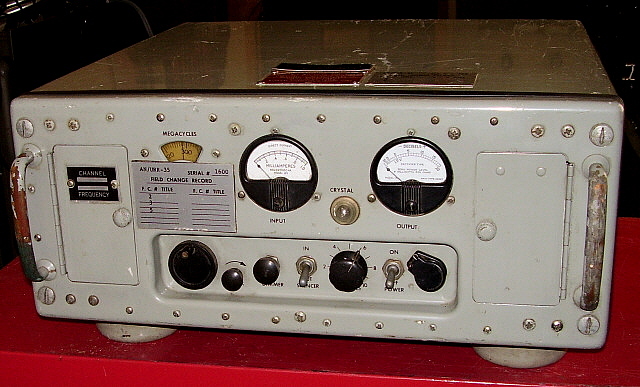 The T-195 is very complex because of its autotune capabilities and because it was designed to essentially be used by operators with no particular skill or training, thus the transmitter had to basically "take care of itself." Several of the thermo-switches will shut down the transmitter if things get too hot. A few minutes "cool down" is normally required to let the thermo-switch reset (you should also correct the problem that caused the over-heating in the first place.) The T-195 is robustly built so reliability was usually pretty good. The photos below show the densely-packed modular design and the complexity of the T-195. T-195A and B Versions - Late in the military's use of the T-195 (just before the Vietnam War era) there was a retrofit to convert many of the T-195 transmitters to use a solid-state power supply to replace the +HV dynamotor. The replacement power supply is shaped somewhat like the original dynamotor but has no vent holes or any moving parts. This reduced the total transmitter current required down to about 35amps but the big reduction was in the +HV dynamotor "starting current" that no longer was required. Later, a solid-state power supply for the +LV dynamotor was also available. Still later, these SS power supplies were installed from the factory and these models will be designated as the T-195A or T-195B. Although it's likely that the A version has just the +HV PS and the B version has both, I can't find any documentation that states this is the case. A look at the T-195 upper deck. On the left side is the PTO and Exciter-Mulitiplier. Clustered in the center are the Discriminators, Antenna Capacitor and inter-connecting sockets. On the right side is the Antenna Inductance module. 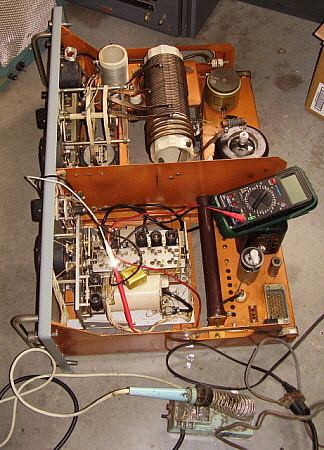 Note the white ceramic form for the motor-driven ribbon-wire variable inductor that is part of the autotune antenna tuning system. To the front of it is one of the blowers and the Output Capacitor selector. Just visible on the lower deck is the back of the LV dynamotor (with the vents) and below the Antenna Inductance module is the +HV SS PS. The +HV PS is built into a case that is the same size and shape as the original dynamotor. Looking at the underside of the T-195. At the upper left is the Modulator module. Note the yellow captive screws that indicate that this small chassis is removable to allow installation of new modulator tubes. The black cylinder is the +HV SS PS. Since the +HV PS had to fit in a specific space that was limited it had to mount like the original dynamotor and be the same shape. The module in the center is the Servo Amplifier. The RF PA module takes up most of the right side of the bottom deck. The air variable is the plate tuning capacitor that is servo motor driven during the autotune cycle. Upper right just below the Amphenol socket is the RF PA blower housing. Circuit - A stout, small and fairly lightweight receiver, the R-392 still has a lot of the features found on it's big brother, the R-390. Frequency coverage is .5mc to 32mc in 32 tuning ranges each with 1mc of coverage. Permeability tuning using slug racks driven by a complex gear train with a PTO, variable tuned IF and fixed Crystal Oscillator providing double and triple conversion is very similar to the R-390 receiver's front end as is the frequency read out provided by a Veeder-Root digital counter. 25 tubes are used in the double and triple conversion circuit that also provides 2 RF amplifiers and 6 IF amplifiers. Also, the IF stages are similar to the R-390 in that mechanical filters are not used for the selectable 8kc, 4kc and 2kc bandwidths. Data modes, e.g., portable RTTY, could be received via the IF output connector (the T-195 was capable of FSK transmission.) The Audio Output is 600 Z ohms and accessed from either of two twist-lock type connectors marked AUDIO or it can also be accessed from the POWER INPUT-TRANS CONT (PI-TC) connector. There is no phone jack on the R-392 because in the GRC-19 configuration the audio was routed to the T-195 (via the PI-TC connector) where typically a telephone handset, the H-33, was used for both transmit (microphone) and receive (earpiece.) The typical field speaker, if used, was the weather-proof LS-166. A Noise Limiter circuit is activated with the Function switch and a Squelch function is also available. 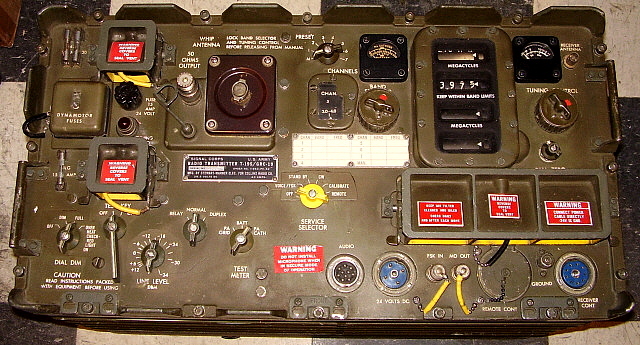 When operated as the GRC-19 there is a short interconnecting cable between the T-195 transmitter and the R-392 receiver using the PI-TC connector that allows the two units to function together with the T-195 providing Break-in or Stand-by functions along with receiver to transmitter Signal Relay capabilities. Variations in the R-392 Receivers - The initial contract in 1951 was from Collins Radio Co. but soon, just like the R-390 and R390A, many other contractors built the R-392 receivers. There are some variations from early production to the later receivers. Early receivers will use 26A6 tubes for the RF amplifiers while later production used an improved version of that tube, the 26FZ6. The change to the 26ZF6 was to help with cross-modulation problems when using the receiver near operating transmitters. Most of the later manuals specify that either the 26A6 or the 26ZF6 can be used as RF amplifiers. Early panels have silk-screened nomenclature while later panels are engraved. The 2kc-4kc-8kc BANDWIDTH nomenclature layout is closer together on early panels but spaced at 90º on later panels. Cabinets on early models have large flutes that run front to back while later cabinets have five "ribs" that entirely encircle the cabinet running parallel with the front panel. These "ribs" strengthened the cabinet significantly. Like many contractor-built items, the color tint of the olive drab paint used varies from contract to contract with some receivers appearing very light brownish-OD while others appear dark greenish-OD. R-392 production ended in the mid-1960s. 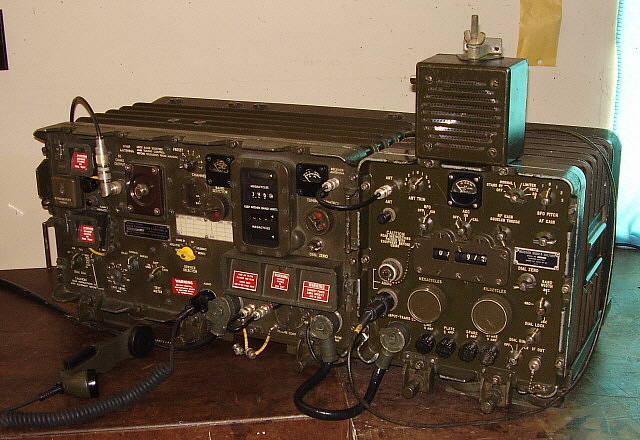 By the early 1950s, the widely-used Signal Corps version of Hallicrafters' HT-4, the BC-610, was rapidly becoming outdated and a modern replacement was needed. The T-368 transmitter was designed to be an updated replacement that would fill similar needs for a medium power, continuous duty transmitter that could be placed in communication huts, set up for mobile operation from a truck or set up for stationary operation. The design allowed for 400 watts to 450 watts of RF power to be delivered to a full-size resonant antenna or, if the BC-939 tuner was employed, a random length end-fed wire or a mobile whip antenna could be used. The RF output tube is a 4-400A that is modulated by two 4-125A tubes. It appears that Collins Radio had some engineering input (or influence anyway) on the T-368 as the design uses a Collins' style PTO to drive a permeability-tuned Multiplier/Exciter module which in turn drives the RF output tube. Also, a Veeder-Root type of mechanical digital counter is used for the transmitter's frequency readout. The similarity to other Collins' exciter-transmitter designs is apparent. The output section of the transmitter uses vacuum variable capacitors in the Pi-network since the +HV is over +2500vdc. There were several versions produced with minor differences that required different letter suffixes for identification. Several different contractors built T-368 transmitters throughout its production history and while Barker & Williamson (B&W) built some of the first contracts other companies that built later T-368s included Stromberg-Carlson, TRW, Bendix and many others. 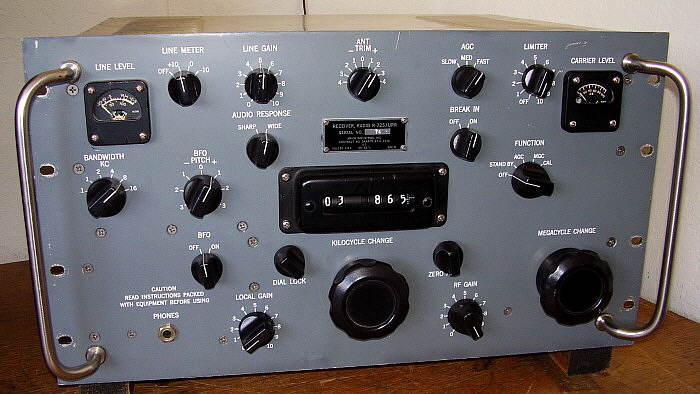 Besides the "Basic" or non-lettered version, there are lettered versions from A through F. The T-2368 was a SSB transmitter based on the T-368 using the same basic three deck construction. The T-368/URT shown in the photos left and below is the "Basic" or "non-lettered" version with B & W as the contractor and with serial number 29 assigned to it. The contract is from 1952. The T-368 will transmit in AM voice, CW or FSK modes. It can also be used as an RF amplifier using an external low power exciter via the External Input. For FSK RTTY operation, a proper FSK driver is necessary and is connected to the FSK input on the front panel. Many T-368 transmitters were set up in mobile RTTY communications huts and designated as the GRC-26. These huts contained two Collins R-390 receivers and a CV-116 diversity RTTY converter. Two TTY printers and one TTY transmitter/tape perforator were also used. The T-368 was set-up with the BC-939-B (designated as TN-339/GR) antenna tuner and the ME-165/G SWR bridge along with the MD-239 RTTY Modulator. Three vertical whips were used, two for diversity reception and one for transmitting. Also, a tapped doublet could be used for transmitting if the BC-939B was bypassed. Additionally, 1000 feet of copper wire, several masts and guy wires were in the spares kit for building various antennae for either receiving or transmitting, as needed. The GRC-26 hut was mounted to a 12 ft by 7ft trailer and towed to field sites. Also, a trailer-AC generator was part of the equipment. With the GRC-26, Voice or CW communications were only used in emergencies. However, it was common practice to establish comms using CW and then switch-over to RTTY. To transmit voice generally required the use of the M-29 (or similar) carbon microphone connected to the CARBON MICROPHONE input but this isn't strictly the only way to voice modulate the transmitter. You can also run audio into the 600 Z OHM input via the rear Remote Input connector. Though intended for use with telephone line inputs, the 600 Z OHM input is almost exactly the same electronically as the CARBON MICROPHONE input with the exception that 600 Z OHM 1st Audio Amp has slightly higher gain than the CARBON MICROPHONE 1st Audio Amp circuit and there is no bias voltage or coupling capacitor in the input circuit. The disadvantage to using the 600 Z OHM input is that the mike cable must be routed to the back of the transmitter. Also, sometimes the 600Z OHM line picks up hum since the shielded cables can develop ground loops depending on the version of the transmitter (usually only on early versions.) Push-to-Talk is also available at the Remote Input. If you switch between the Carbon input and 600Z ohm input, be sure to reduce the Gain on the unused audio input to zero. This grounds the grid on that audio stage preventing noise from entering the Speech Amp. The T-368 is heavy,...a brute that weighs-in at around 650 lbs. It's physically large - around 30"W x 40"T x 18"D. Generally, the T-368 will be found mounted on the military base plate which may (or may not) have large casters installed. If casters are installed it allows for easy "rolling" moving of the transmitter once it is within the room where it is going to be used. To remove any of the three decks is arduous work due to their weight (the PS section alone weighs well over 200 lbs!) Fortunately, almost all troubleshooting and certainly all routine maintenance can be performed by removing the D-zus fastened rear cover and, in some instances, extending a particular deck out enough to access underneath that chassis. If more extensive rework is necessary, the T-368 usually requires two men to disassemble or reassemble due to the massive size and weight of the individual decks and their component parts. The T-368 will provide a powerful signal that can dominate the frequency but the transmitter shouldn't be modified from its basic design as a military "communications" transmitter. Modifications installed to make the T-368 sound like an AM Broadcast transmitter will defeat the original design intent and go against the whole idea of collecting, restoring and operating vintage military radio transmitters in the first place. It is acceptable to disconnect the carbon mike bias wire and tape its end. Then move the mike input wire to the opposite end of the coupling capacitor. This allows a crystal or dynamic mike to be connected to the CARBON MICROPHONE connector on the front panel. An Astatic TUG-8 amplified base will allow several different types of mike heads to be used. This is about all that a T-368 needs to produce good quality AM audio on the ham bands. photos: 1952 B&W T-368 sn:29 showing the three decks and the cabinet during its "tear-down" to inspect, repair, clean and "de-mod" the transmitter. photo far left: PS in front. Modulator behind. Note the SS rectifiers. These have been replaced with original rectifier tubes, 3B28 types. photo left: Cabinet which does contain all of the interconnects and harnesses. There was an abrasion on one harness that cut one of the wires. This happened because of broken cable mounting straps that allowed an incorrect position of the harness in relationship to the Modulator Deck. photo right: The RF deck during repair of the Output Network Band Switch micro-switch interlock. The interlock switches off +HV if the band switch is moved with +HV on. More information on T-368 transmitters? For the ultimate, detailed information source, go to our web-article "T-368/URT Military Transmitter - Repair, Rebuilding and Operation" for history, circuit details, repairing and restoring, performance and more, with lots of photos. Navigation link below in the Index.